We walked around this little town and we have never seen so many opal stores. We went inside some, but the human already have some opals, and Zeb and Eider don’t think any new opals will be coming home with us. 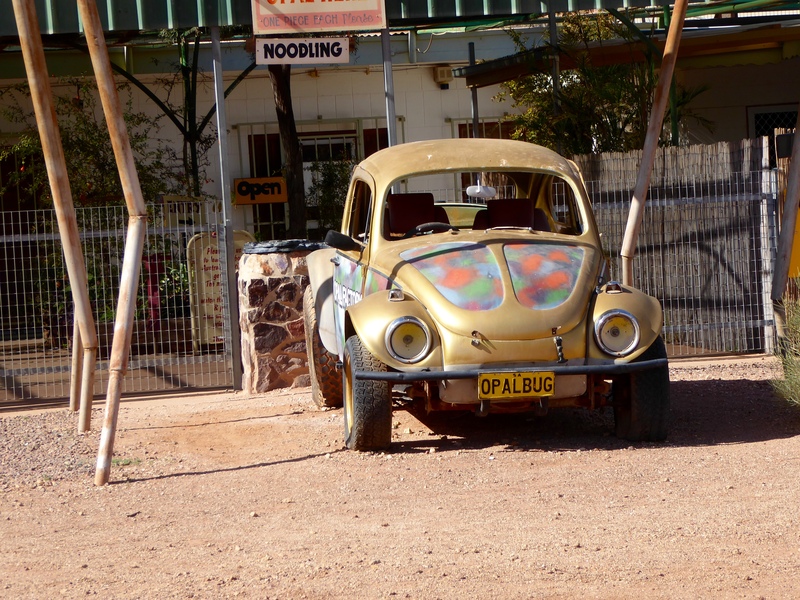 We liked this car, the Opal Bug, at the Opal Beetle. 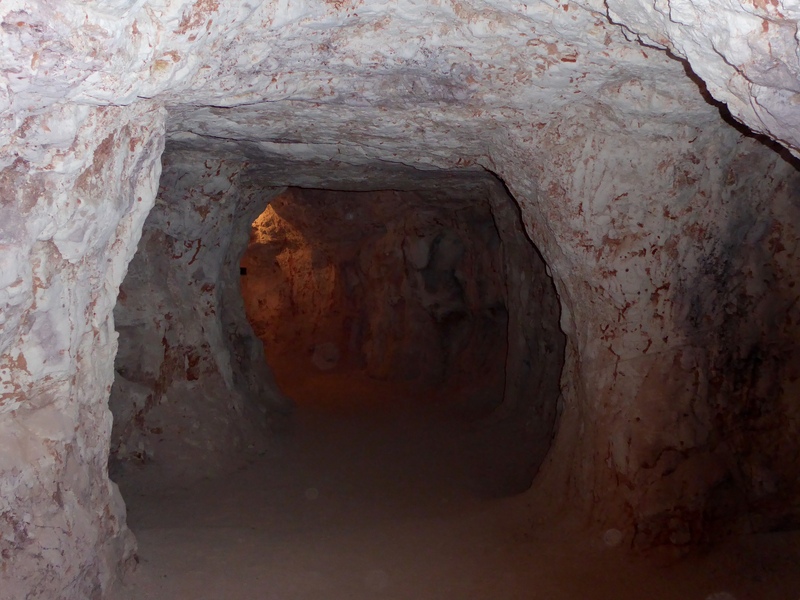 We entered the Umoona Opal Mine and Museum. 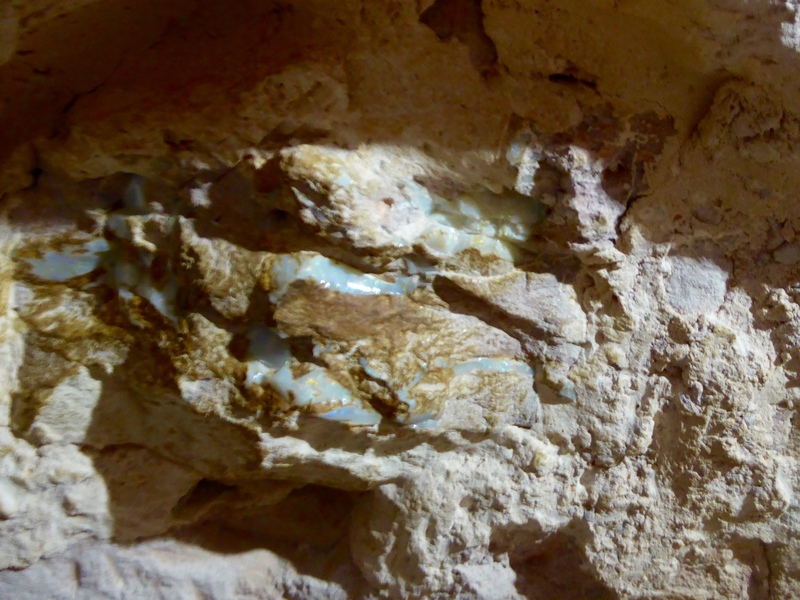 A layer of opal still in the rock. 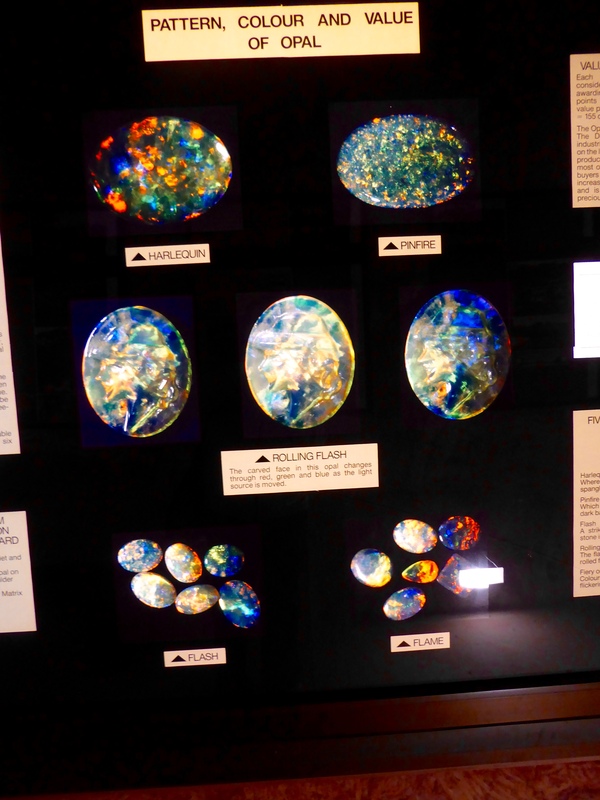 This opal is great and they had a wonderful gift shop. But still no opals going home with us. These rock formations are known as The Breakaways. 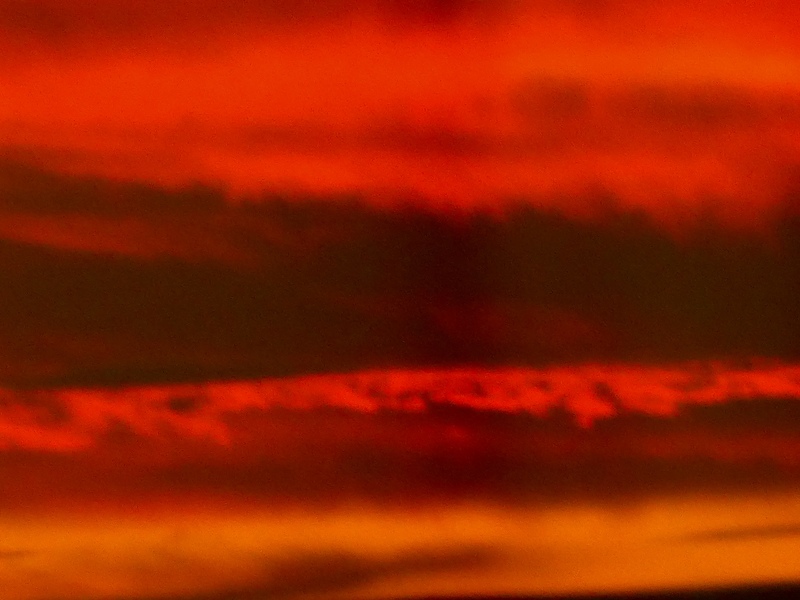 Look at this sky. Love the clouds. 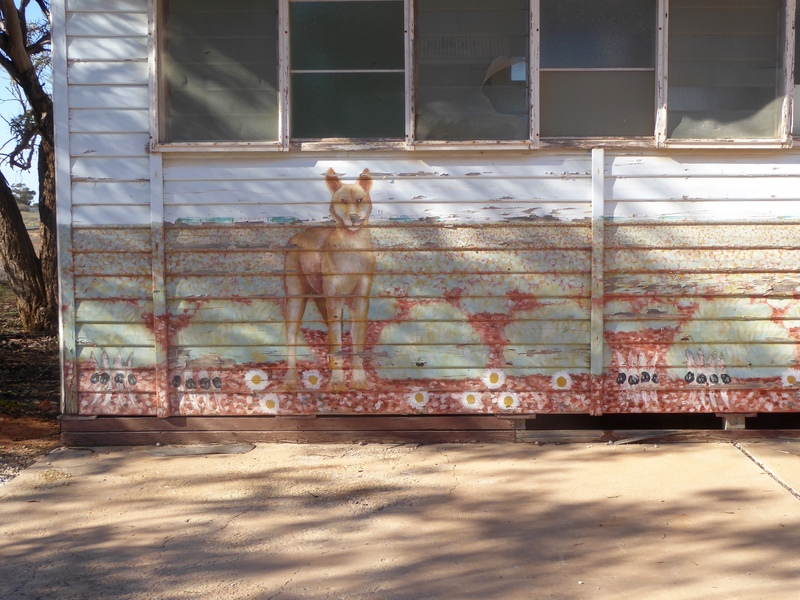 Nearby is the dingo fence, or the dog fence. 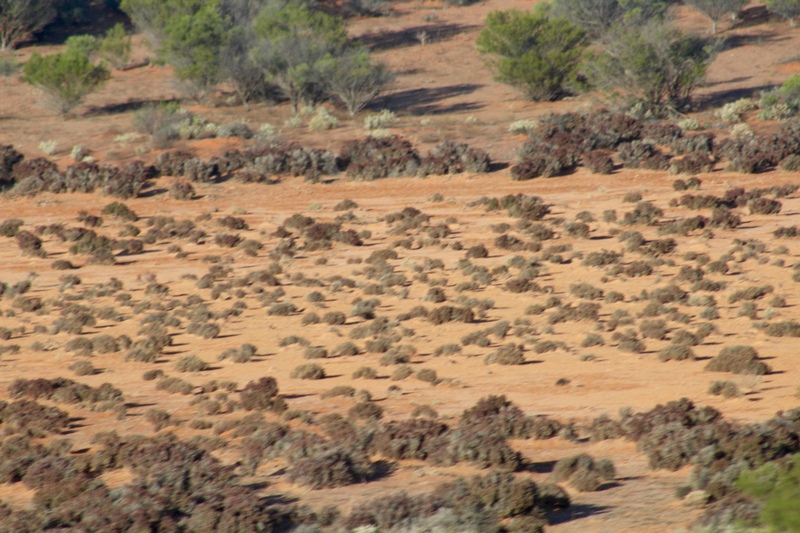 This dingo fence is the longest structure in the world. It is even longer than the Great Wall of China. 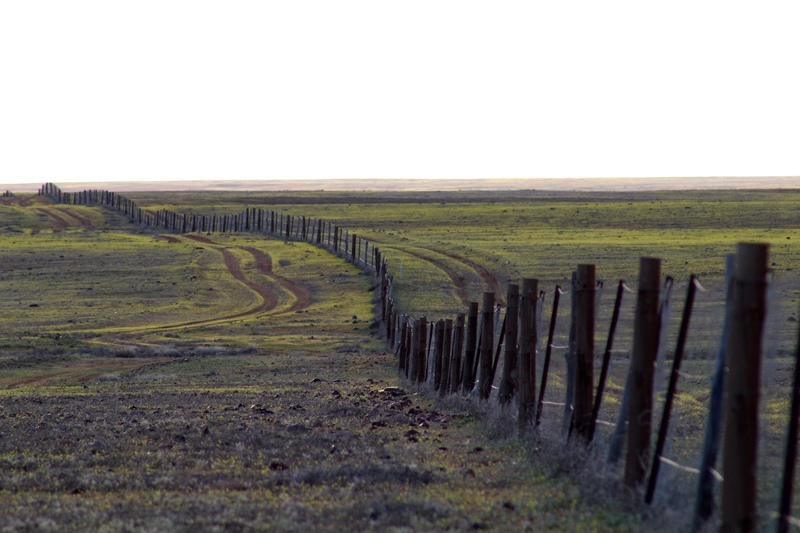 This fence now extends for 5,300 kilometers. At one time it extended 9,600 kilometers. 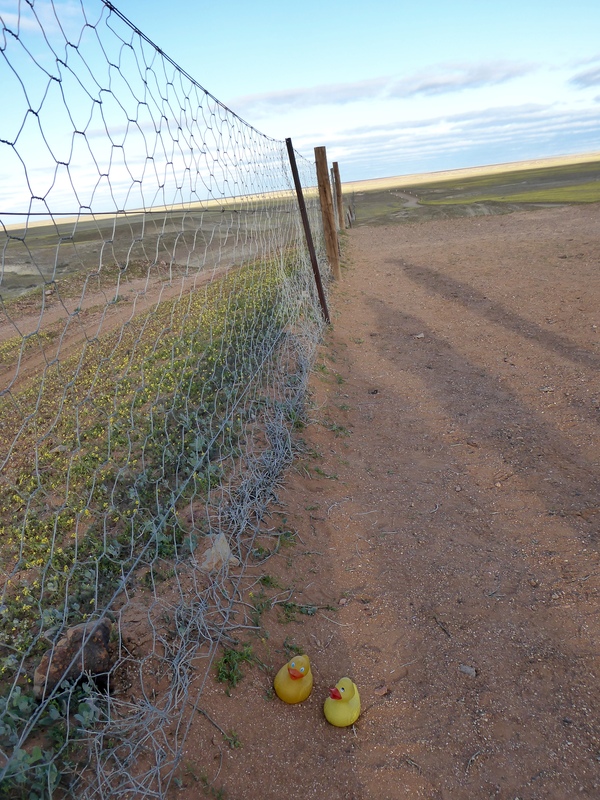 The fence was built by ranchers to prevent the wild dingos from the north from killing the stock The dingo fence was built in 1946. 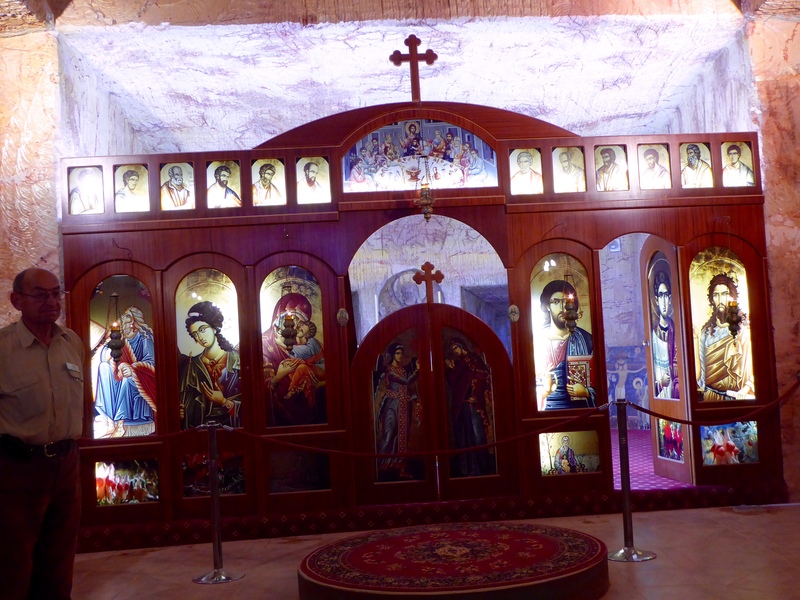 We then visited the Underground Serbian Orthodox Church of Saint Elijah Parish. 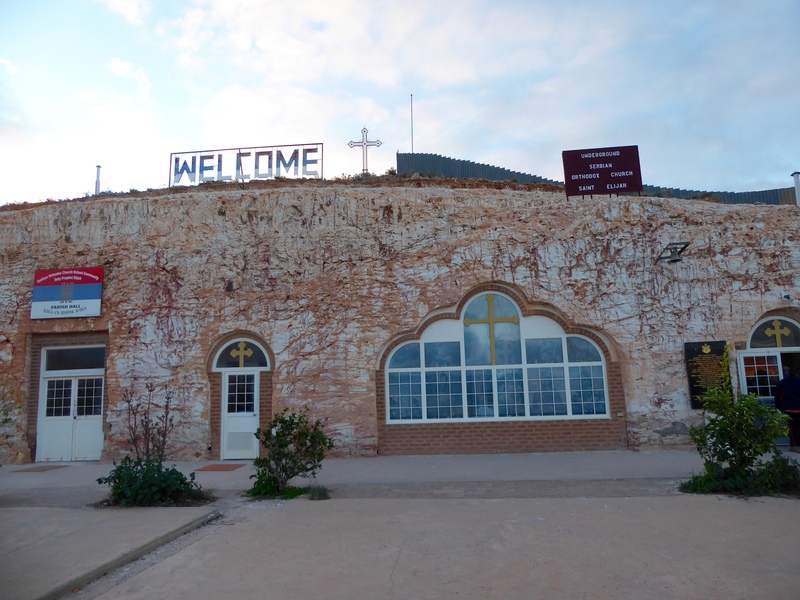 We are entering the tunnel leading to the interior of the church. This is the view from the church balcony. 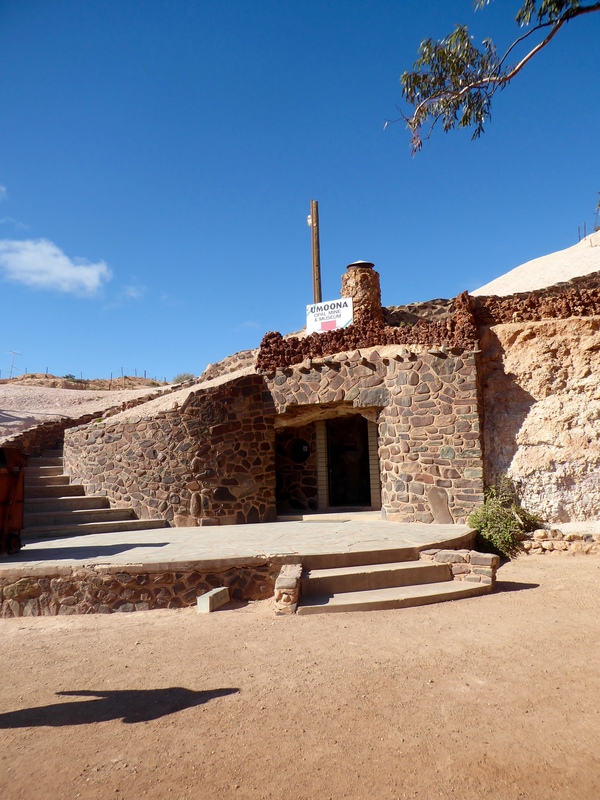 We really enjoyed our visit to Coober Pedy. We hope you visit also. 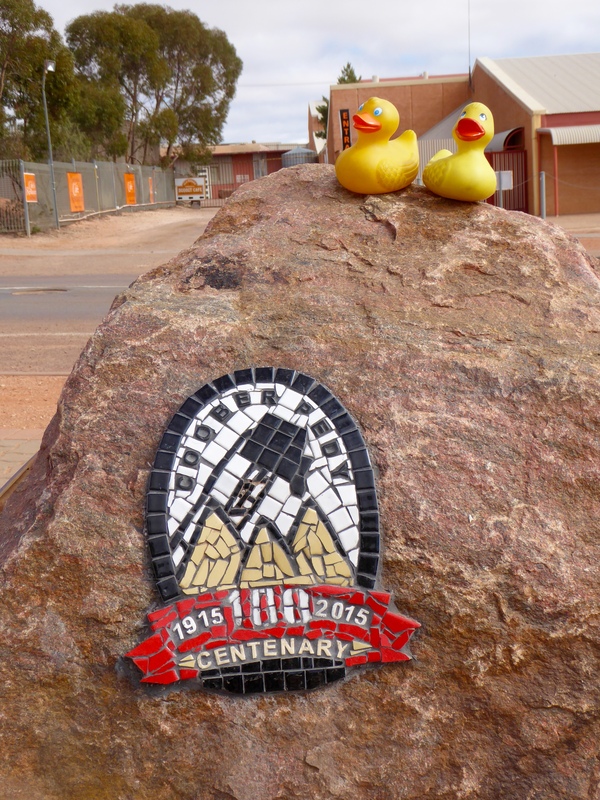 Zeb and Eider Duck and the human are now in the opal capital of the world. 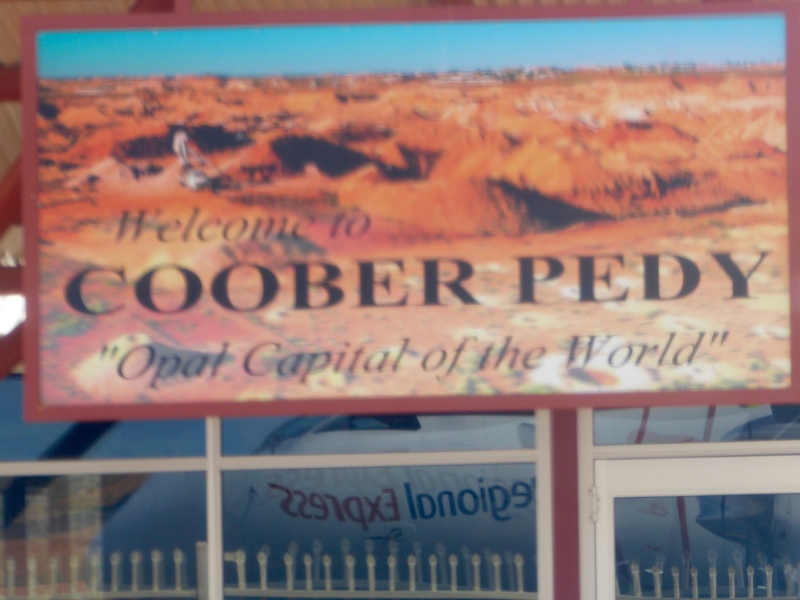 We are in Coober Pedy, South Australia. 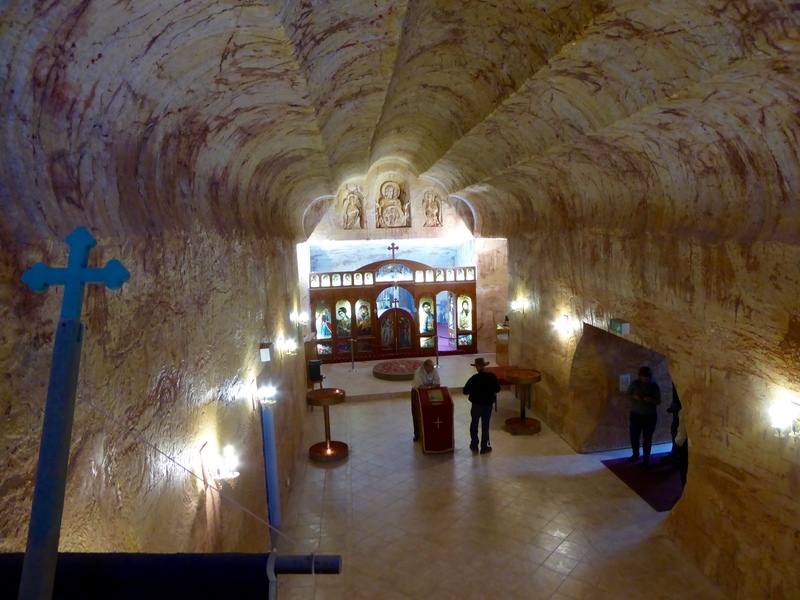 Coober Pedy is in the southern outback desert. In the heat of summer, temperatures of 50 degrees Celsius have been recorded. For those of us using Fahrenheit temperatures, that is about 124 degrees. 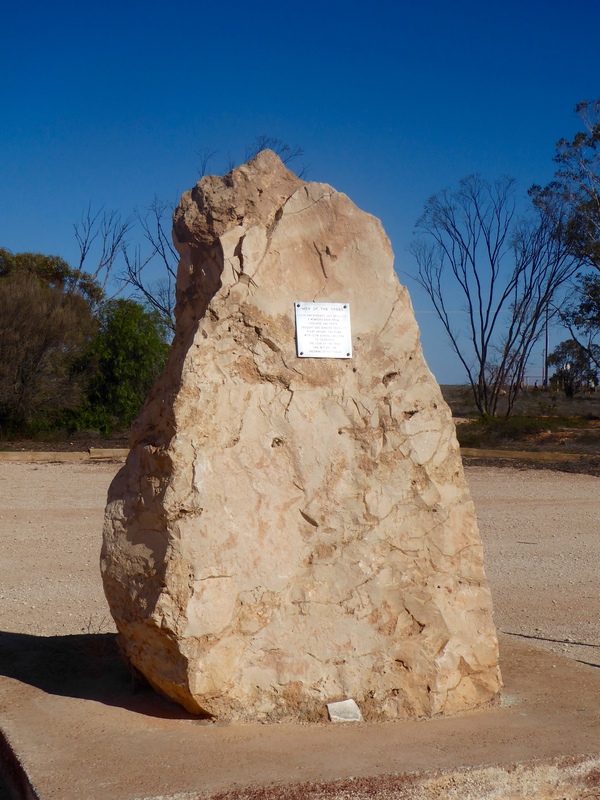 The first opal was discovered by Willie Hutchison in 1915, and the town was born. 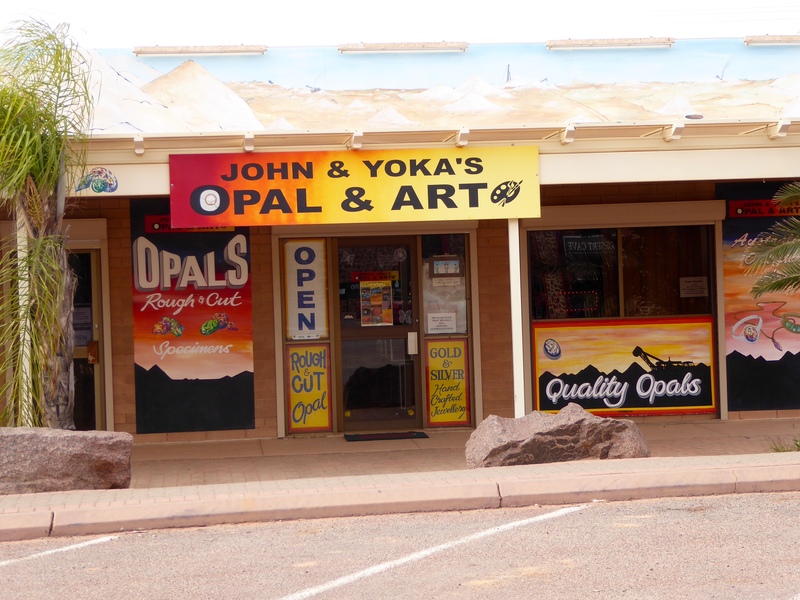 95% of the world’s opals come from Australia and Coober Pedy produces more than any other area of Australia. When World War I ended, returning soldiers came to find opals. There was very little wood to build homes and the soldiers had lived in underground fox holes during the war. 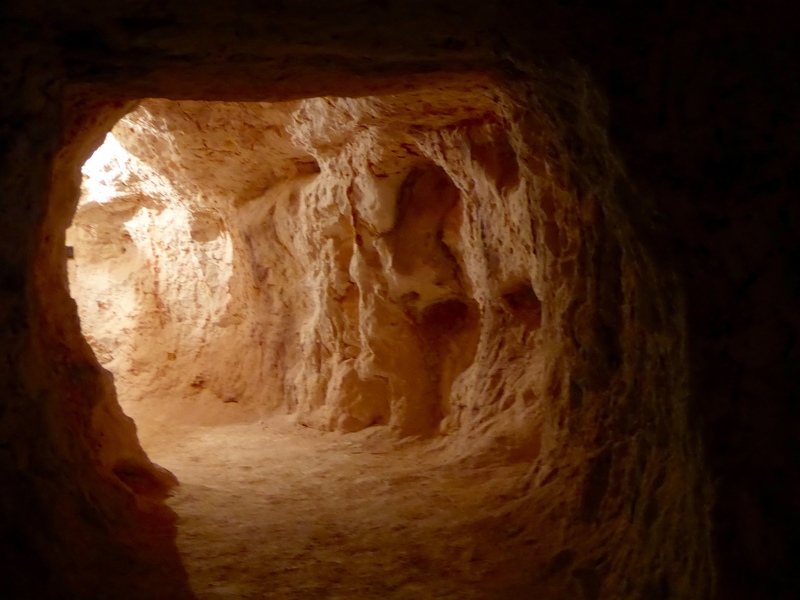 With no wood and extreme heat, living underground was the best solution. 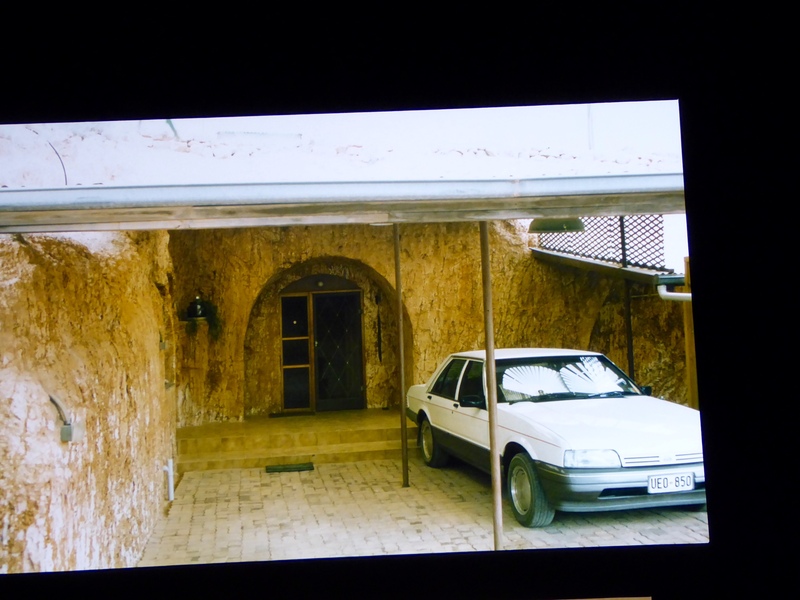 The home were called dugouts, as most were dug out of the side of a hill. 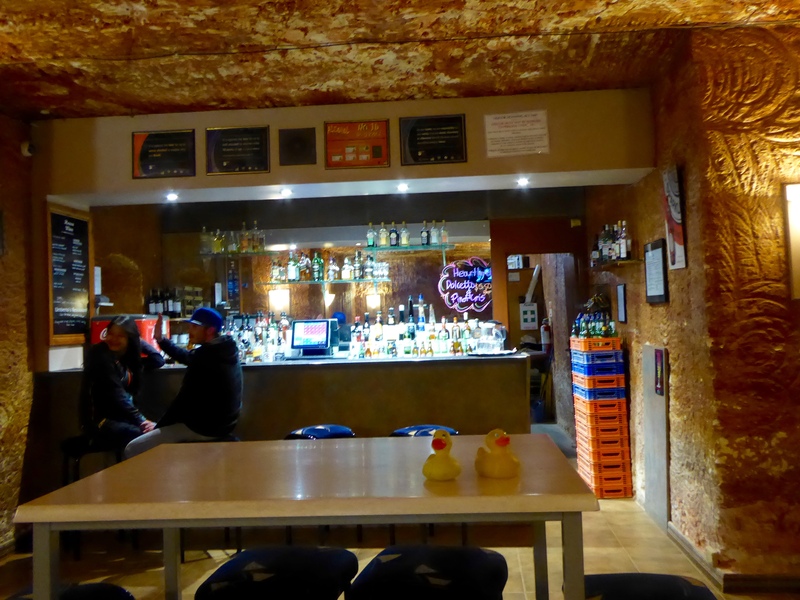 in an underground room. 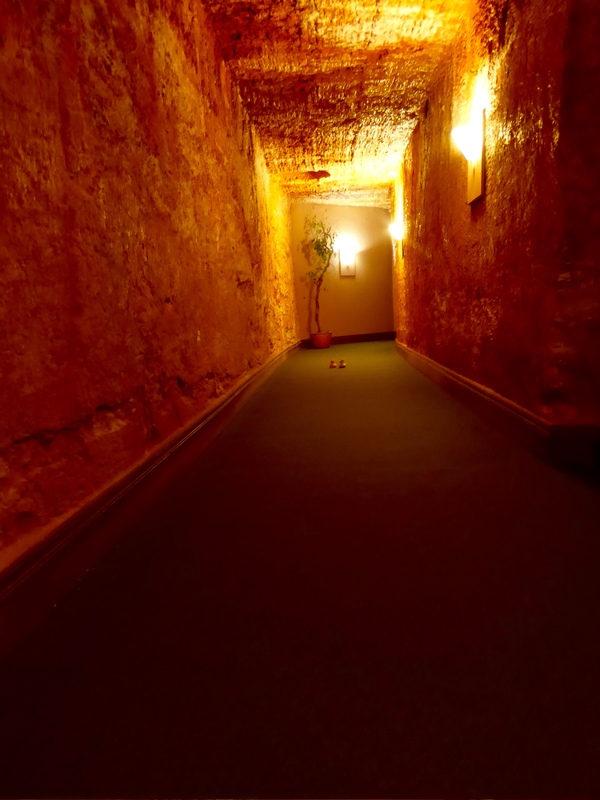 This is the hotel’s underground hall to our room. Since we are underground, the emergency exit must be a staircase leading up to the outdoors. Here we are on the emergency exit. 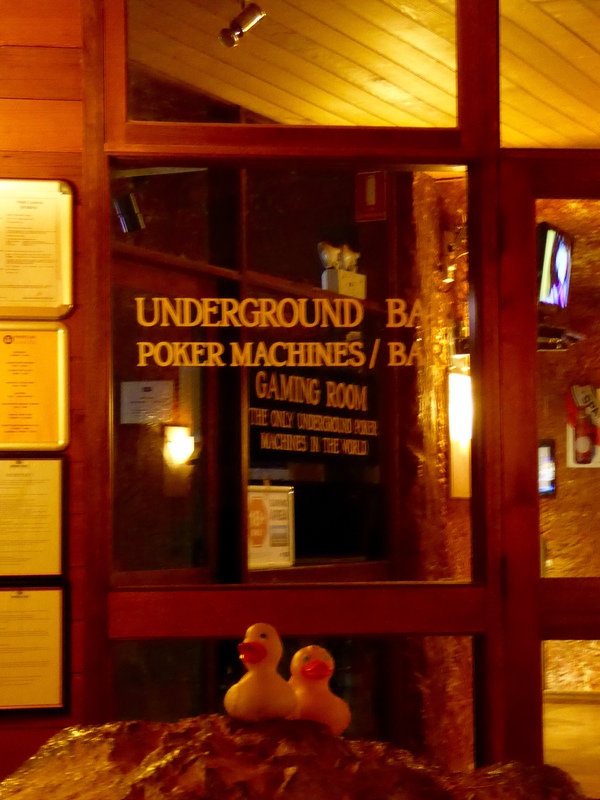 Our hotel has a bar and game room that is underground. 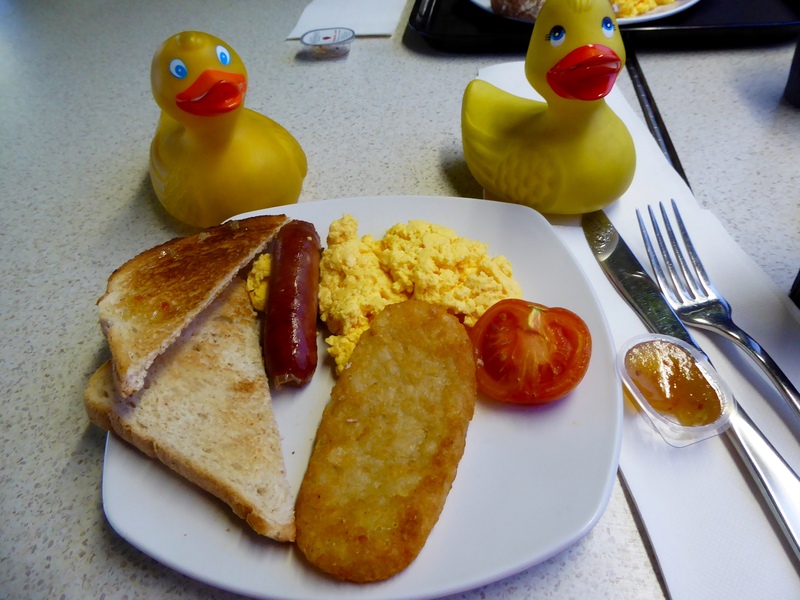 Our breakfast restaurant, the Crystal Cafe, is also underground, as is the gift shop and the opal store, Opal World. 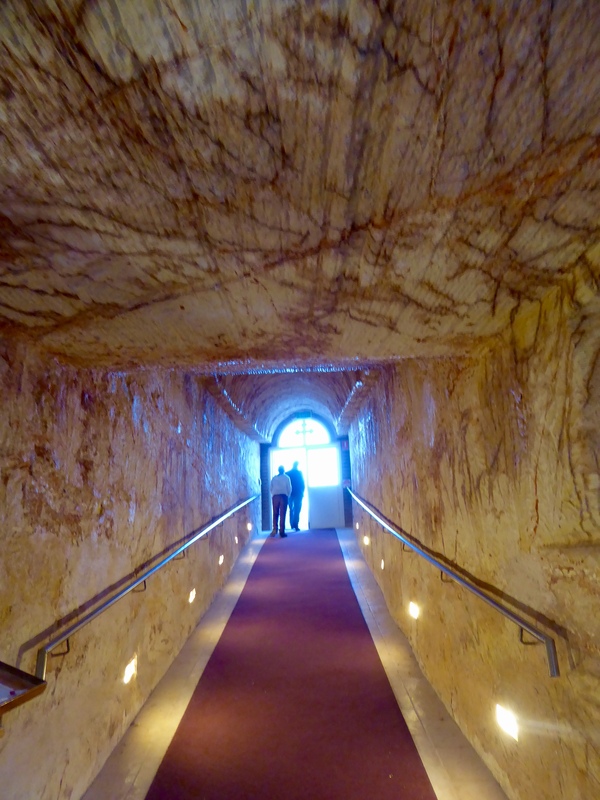 Our hotel, the Desert Cave, has a tunnel from the reception to the restaurant and shops. We are going down the stairs and into the tunnel. In the tunnel we discovered an opal mine and museum. Here is a pretend miner using the mine shaft to enter and exit. 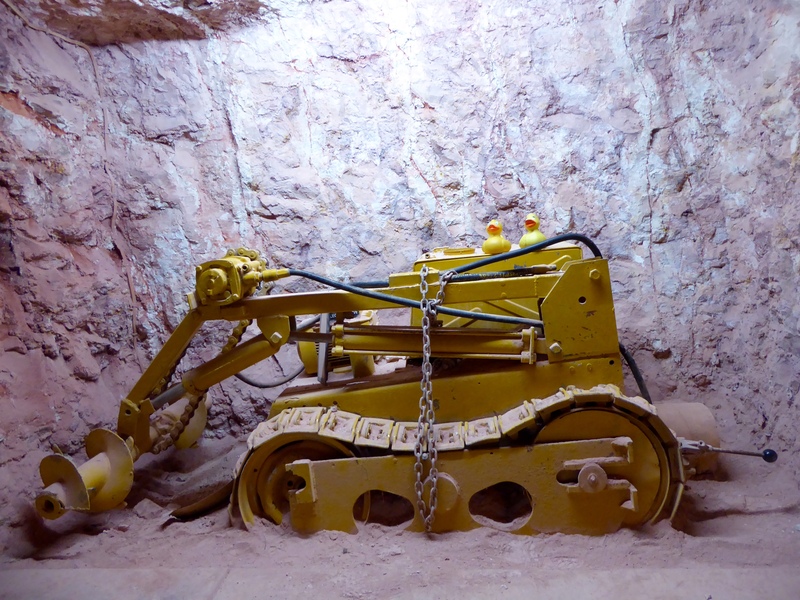 There is a photographic history of Coober Pedy in the tunnel. We are on some mining machinery in the tunnel. 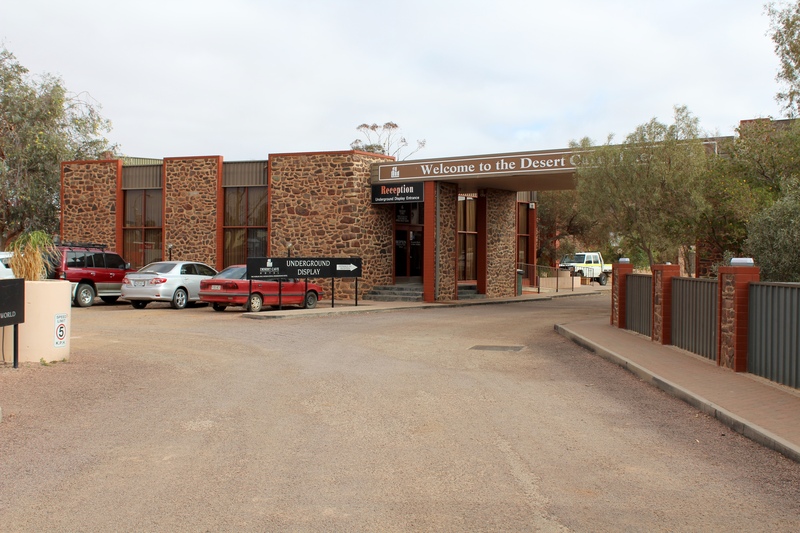 We really liked our hotel and we like visiting Coober Pedy. If you visit here, be sure to arrange transportation to your hotel before you arrive. 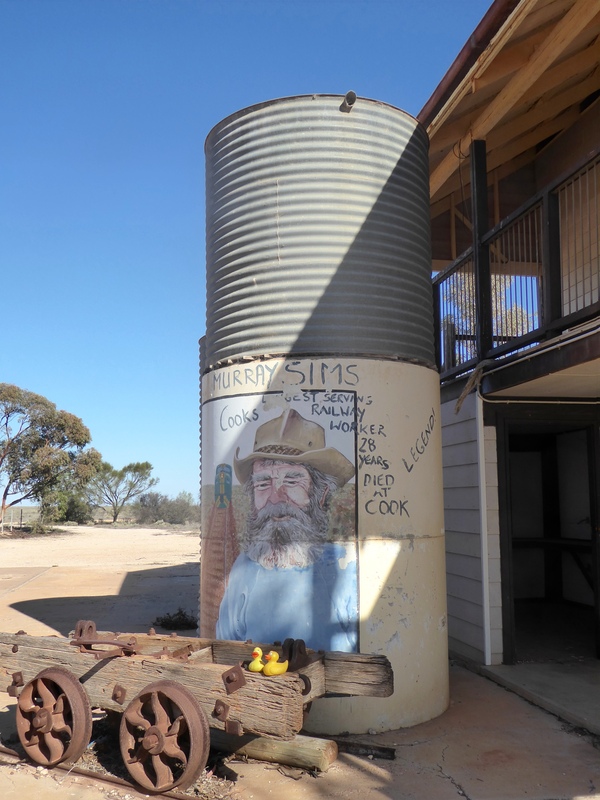 There are no taxis in Coober Pedy. 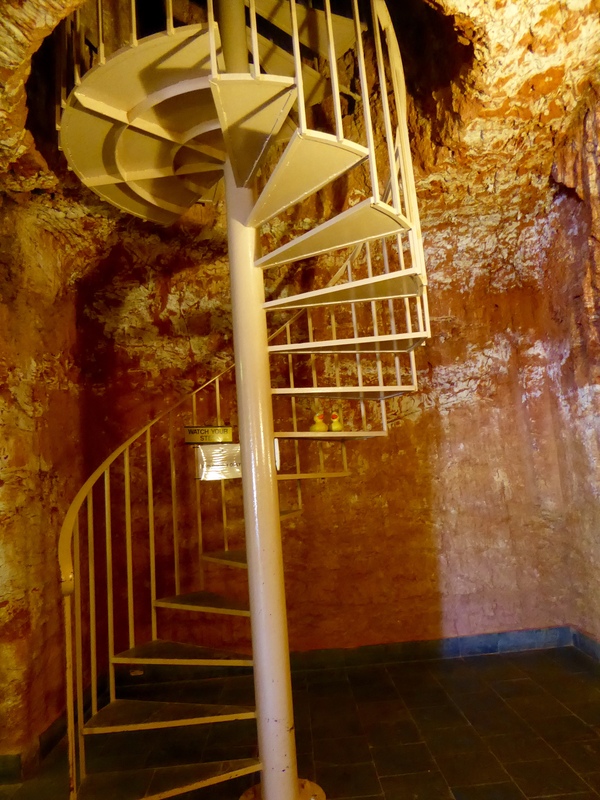 Next time we will show you some of Coober Pedy. We like it here. 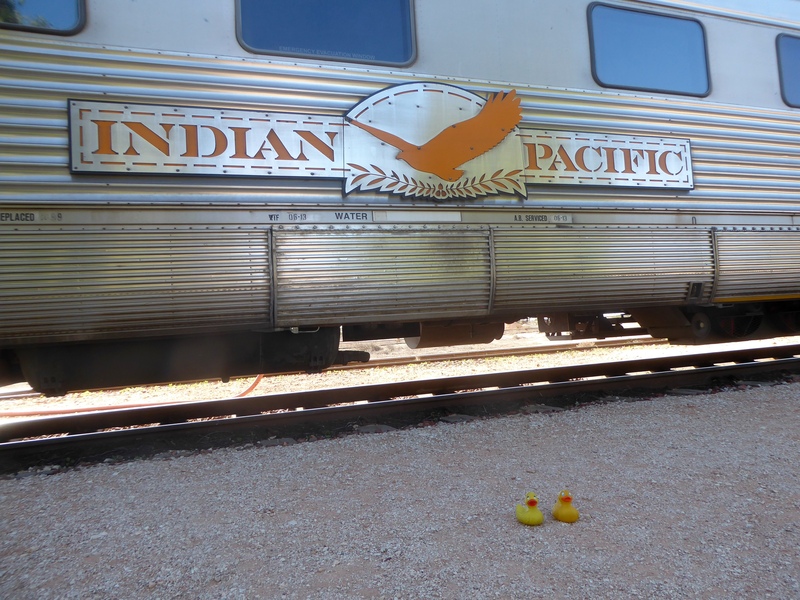 Zeb and Eider Duck and the humans are still on the Indian Pacific Railroad. The train is slowing down. 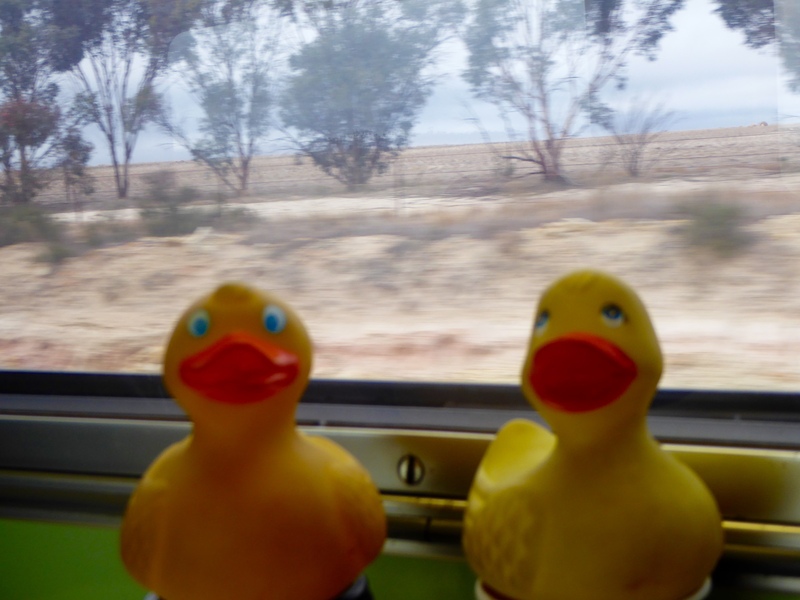 When we, ducks and our 2 humans, entered the town, we doubled the population of Cook, Australia Yes, there are only 4 permanent residents of Cook. 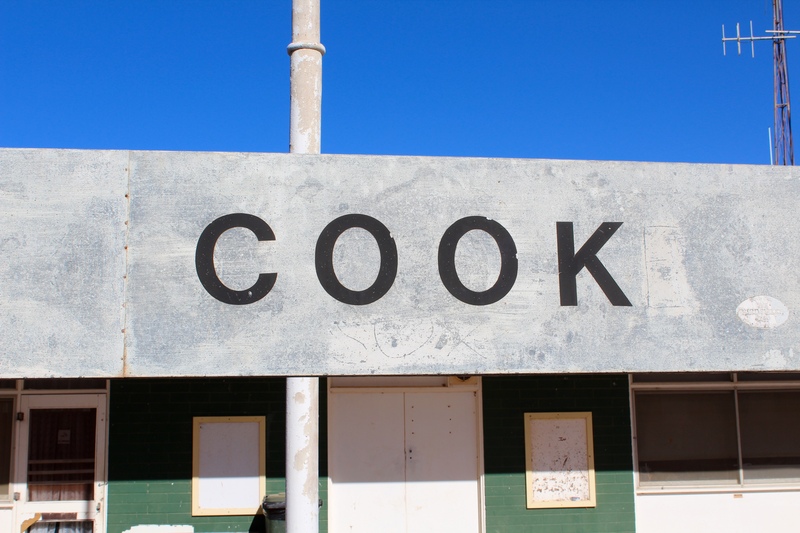 Cook was established in 1917 to support the Trans Australian Railway. That was the fist name of our train Cook formerly had 200 residents. 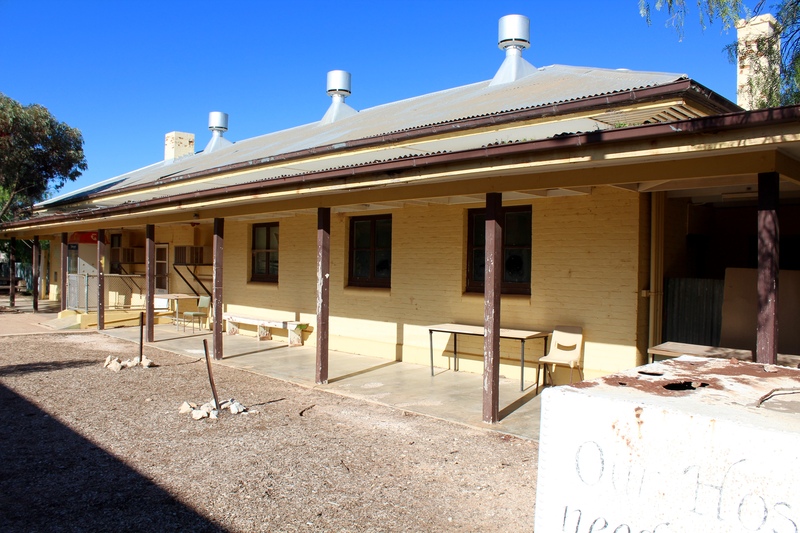 This was the school in Cook, Australia. We like the painting on this tower at the school. More Cook art to see. There was a swimming pool near the school. Doesn’t look like we could swim here now. Here is the train station. 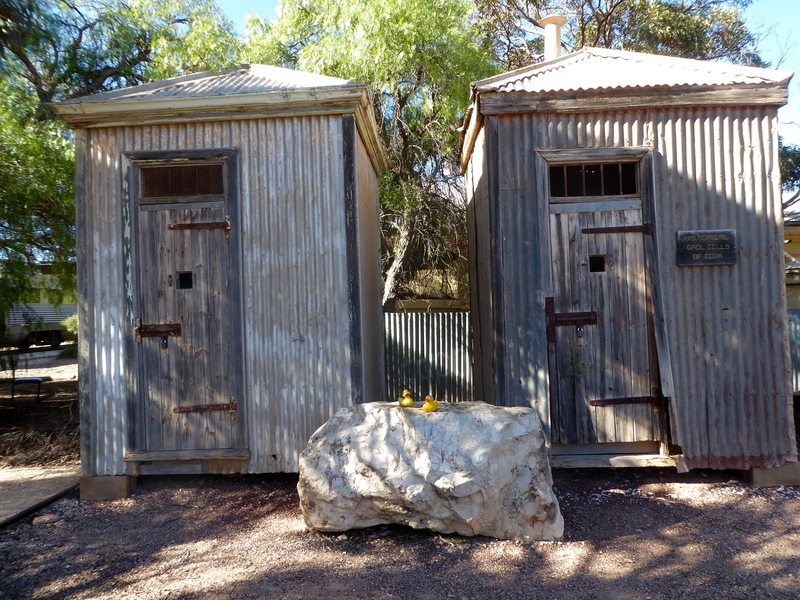 These buildings are not outhouses; they are jail cells,or gaol cells. One is for females and one is for males. The prisoners did not stay here long; they were sent out of town on the next train. Being in jail in these metal cells was like being in prison in a cooking pot. 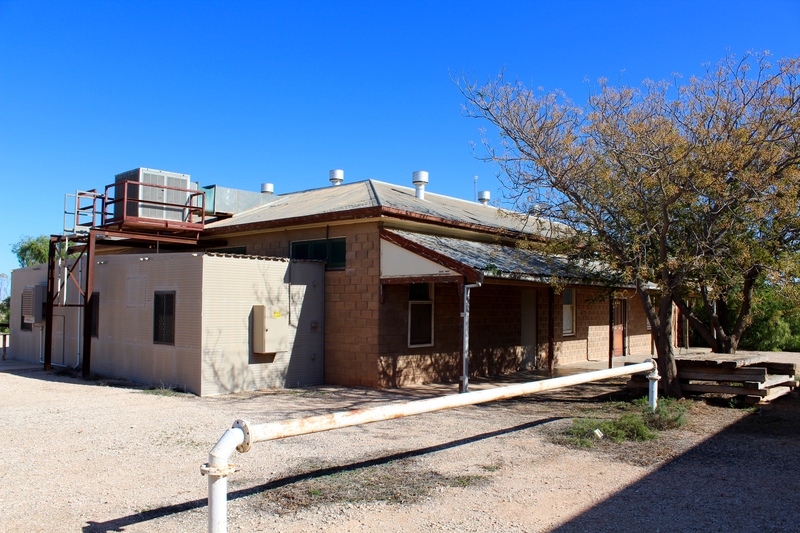 The city of Cook was built on the Nullarbor Plain, which is known for the lack or absence of trees. 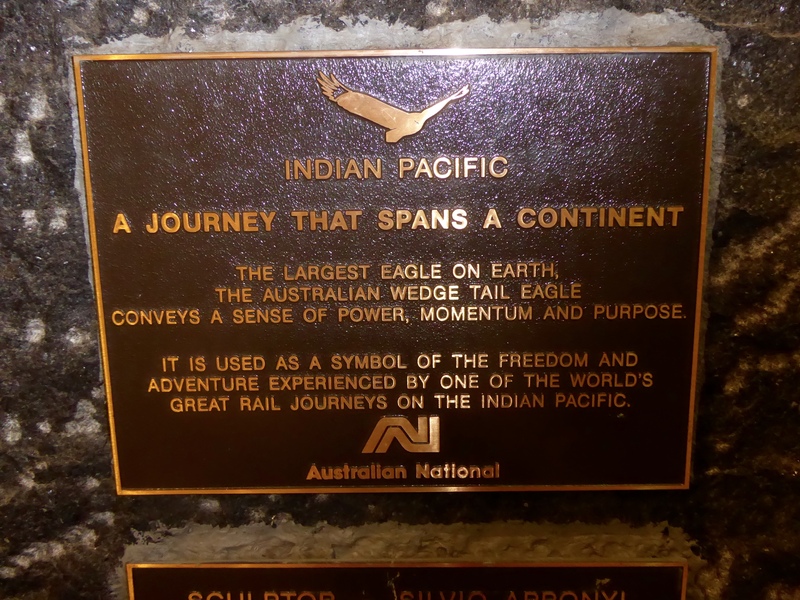 This rock with the plaque, commemorates the effort of men trying to defy this idea. These were the Men of the Trees. In 2006, 100 trees were planted in Cook. The surviving trees are the tallest on the Nullarbor Plain. 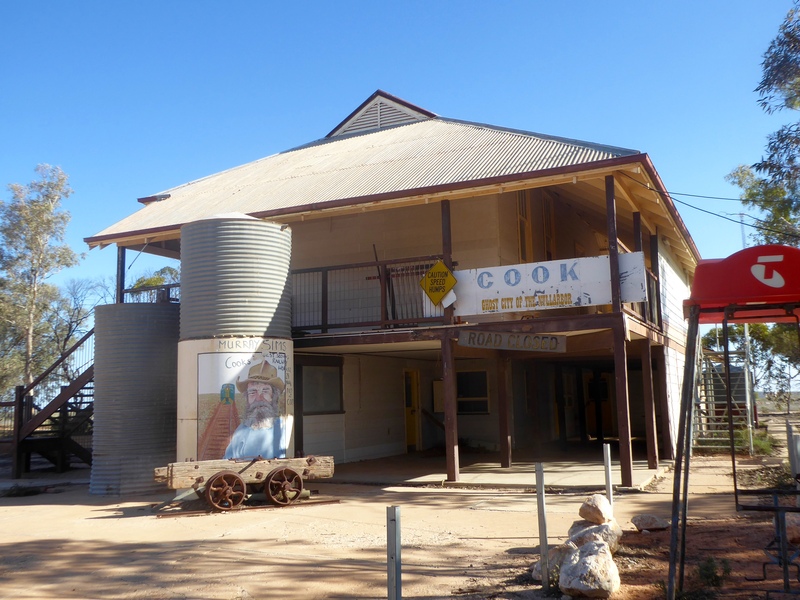 When the railroad was privatized, most people left town, and now with only 4 permanent residents, Cook, Australia is almost a ghost town. 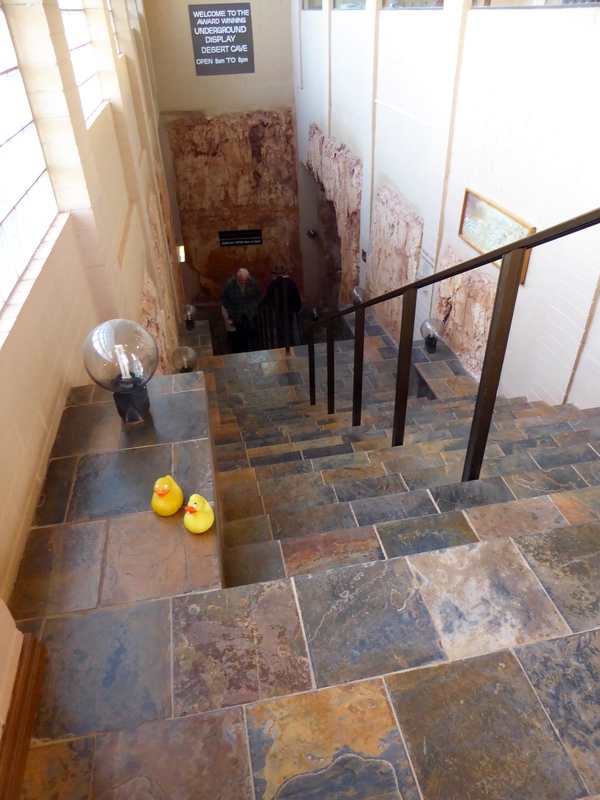 We, Zeb and Eider Duck, and our humans are glad we were able to visit Cook. do not be fooled. 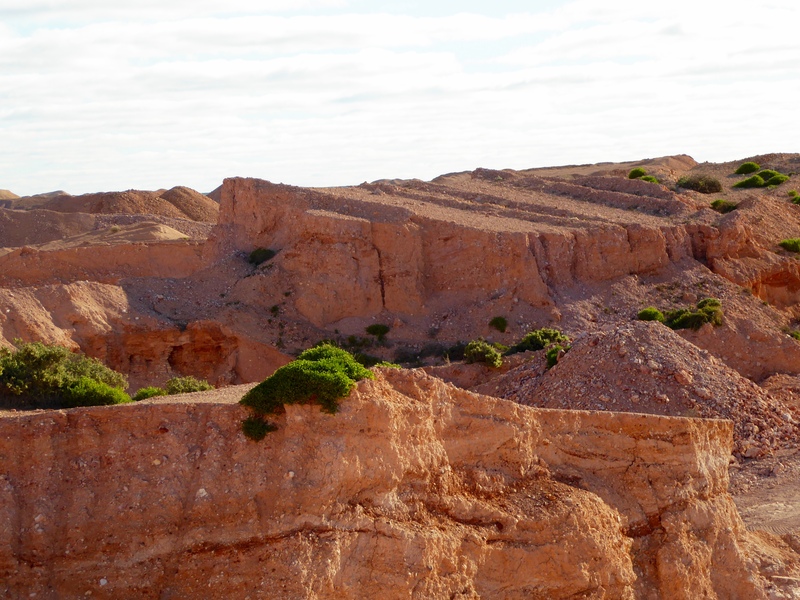 We are still on the Nullarbor Plain, a huge limestone plateau and desert. 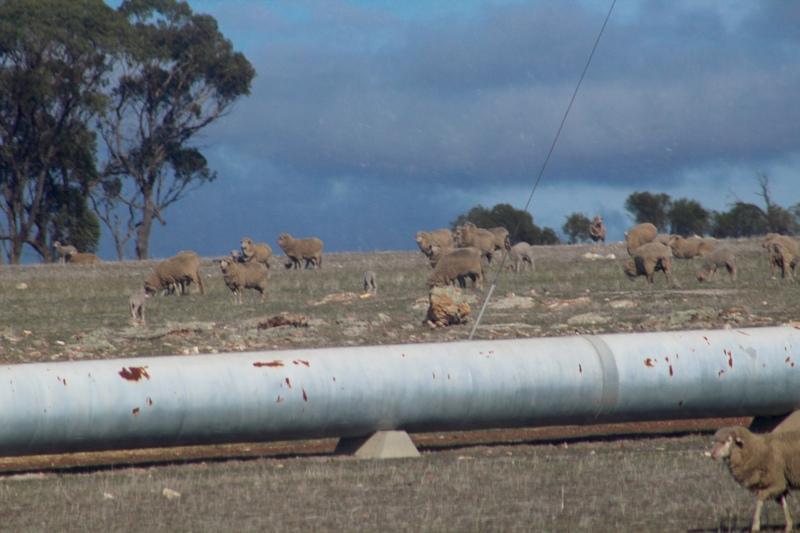 Now we are nearing the end of our ride and we see these sheep and that pipe is for transporting water. All this riding on the train makes humans hungry, so they snacked on Snickers. 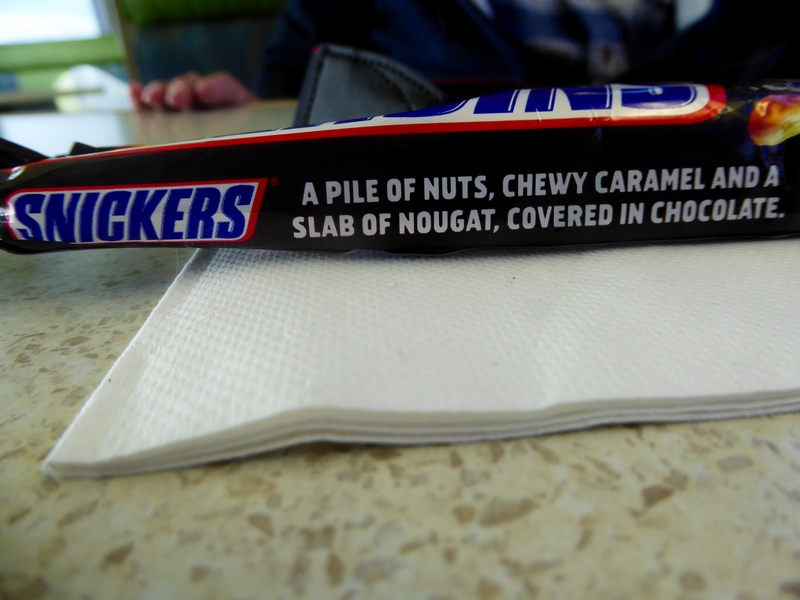 The candy bar tasted just like the Snickers at home, but the writing on the package was a little different. 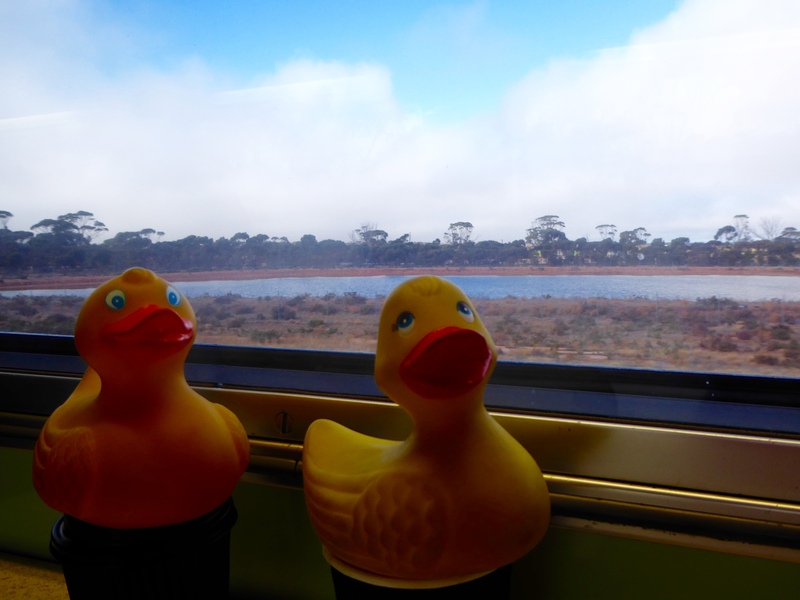 SnickersWe are almost at Perth, so it is about the end of our train ride. This is a great train and we hope you will ride it soon. 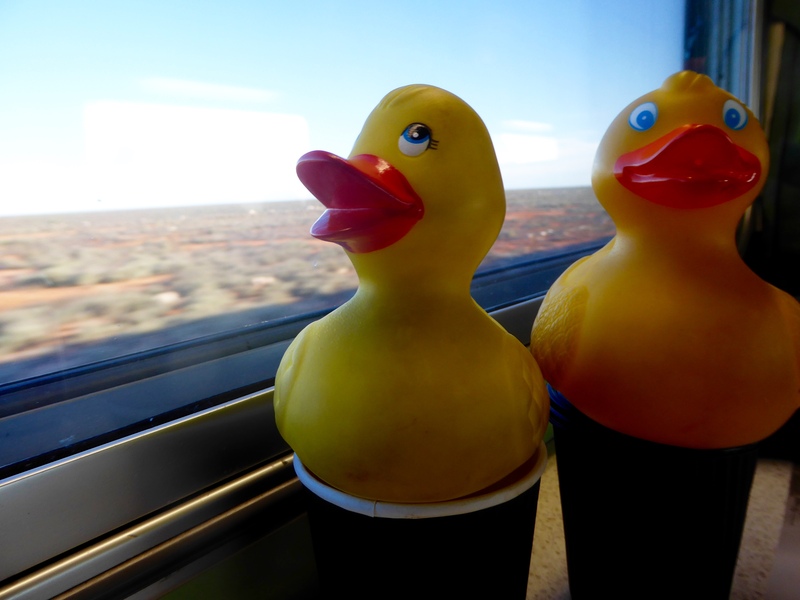 We, the Colorado Traveling Ducks, and humans are going on a train. 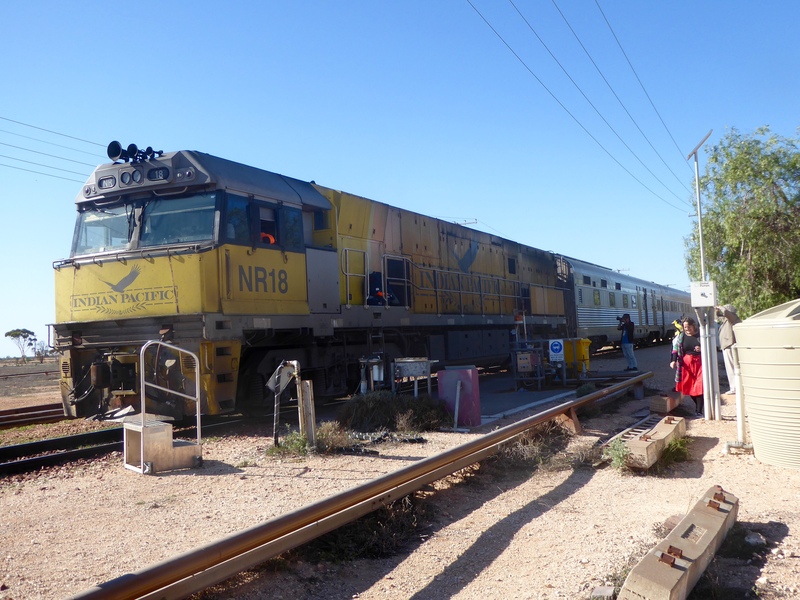 Today we will leave Adelaide and stay on the train until we arrive in Perth, Western Australia, on the Indian Ocean. This sign explains a little about this train. 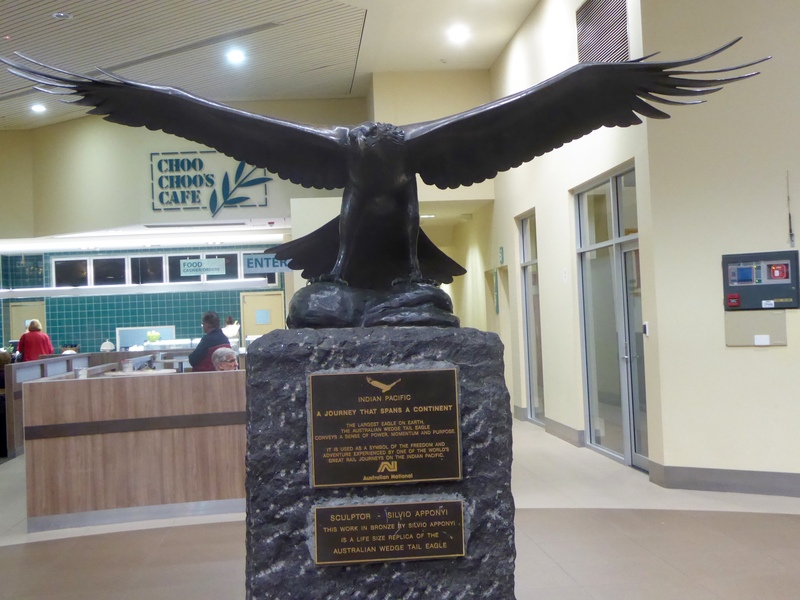 We are in the Adelaide train station and we like this eagle with the sign about our train. Choo Choo’s Cafe is also great. If you take the train, this Adelaide train station has the best amenities. 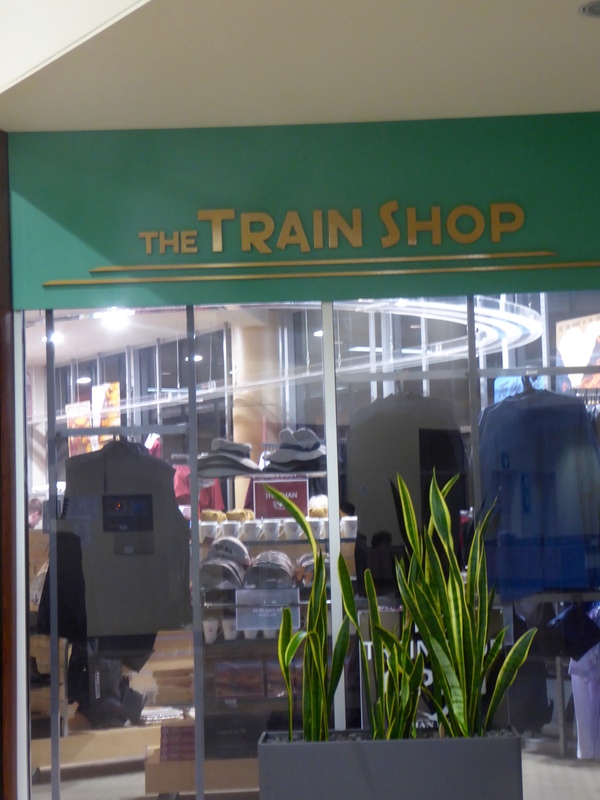 We loved the Train Shop. 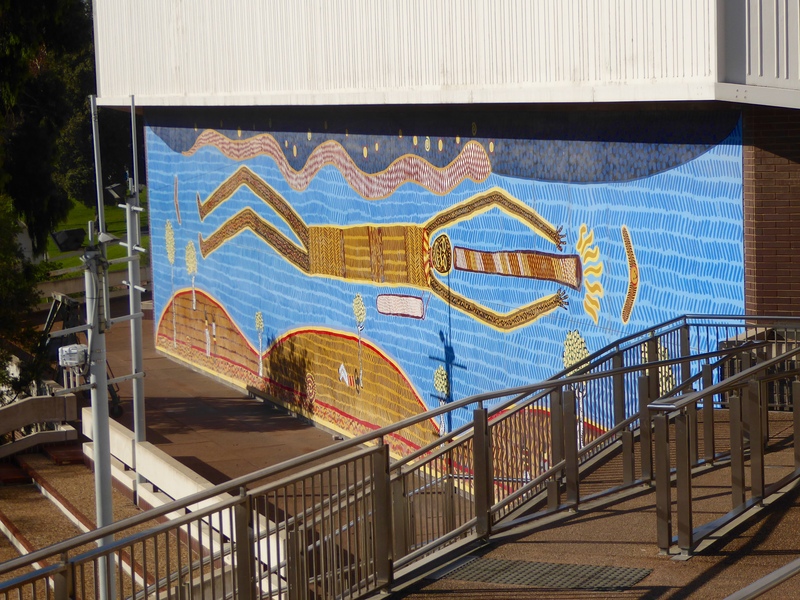 The other train stations we visited in Australia were nice, but not as nice as this one. It is time to get on our train. We are settling in our seats. Very big and comfortable. The seats recline flat, but there is no foot rest. The humans use their carry on bags as a foot rest. We do not have a sleeping compartment. The humans did not want to make early reservations, but these seats are very comfortable. And all the seats were not sold, so we had plenty of room to move around. 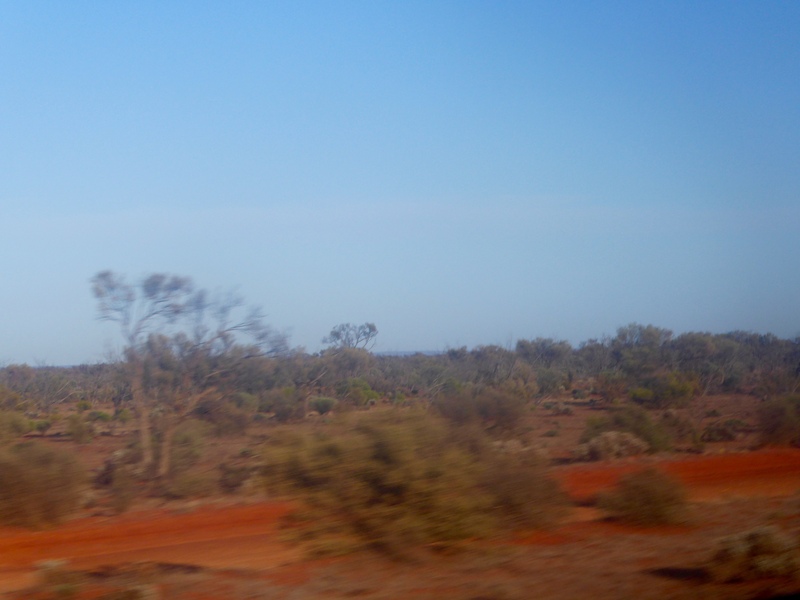 Looking out the window we see the Southern Outback of Australia. The sun is going down, so soon we will sleep. Wow! 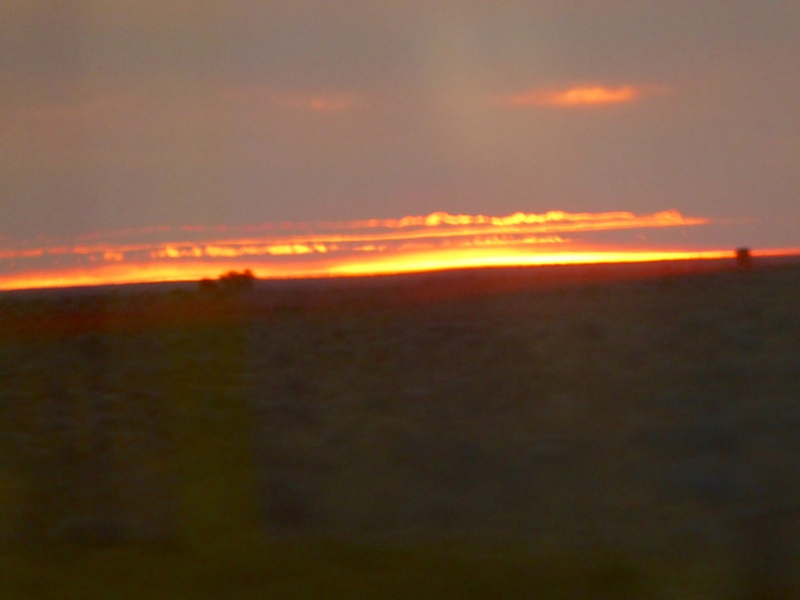 The sunset and sunrise in the desert on the Nullarbor Plain is really bright. 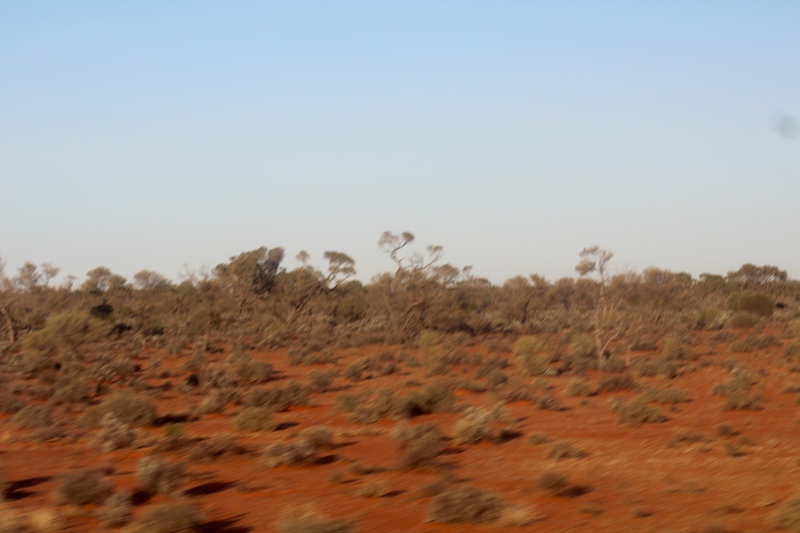 Now that morning has arrived, we see the Outback desert with the red ground. There are a few trees in some places. 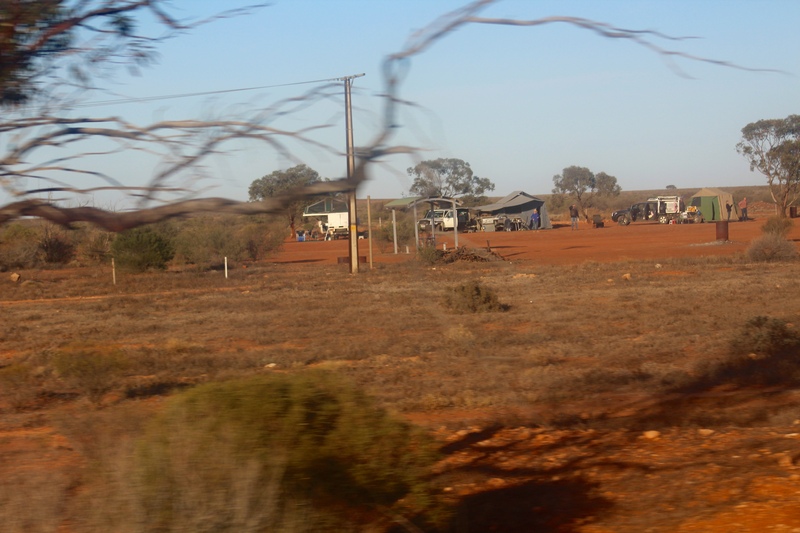 The train is fairly close to the Eyre Highway and there are a few camping places, or caravan parks. 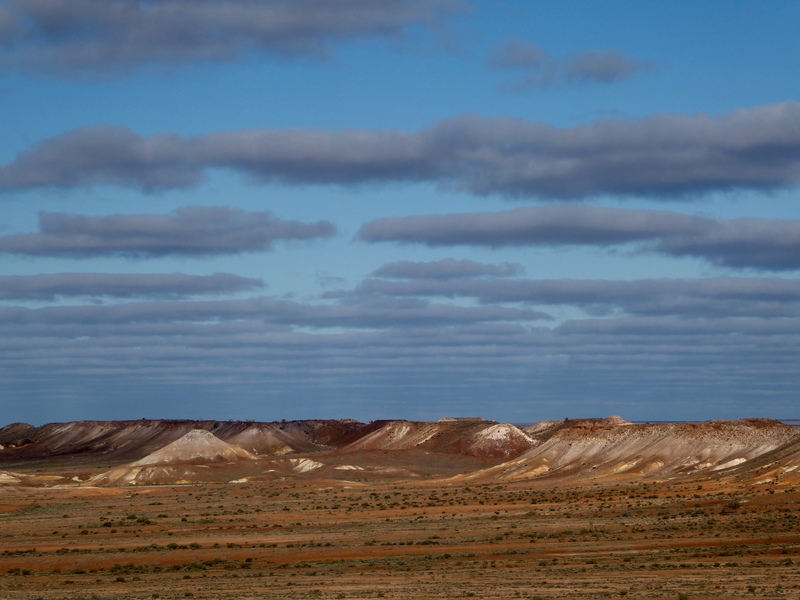 The Nullarbor Plain, is a limestone plateau, mostly a vast waterless, treeless expanse. 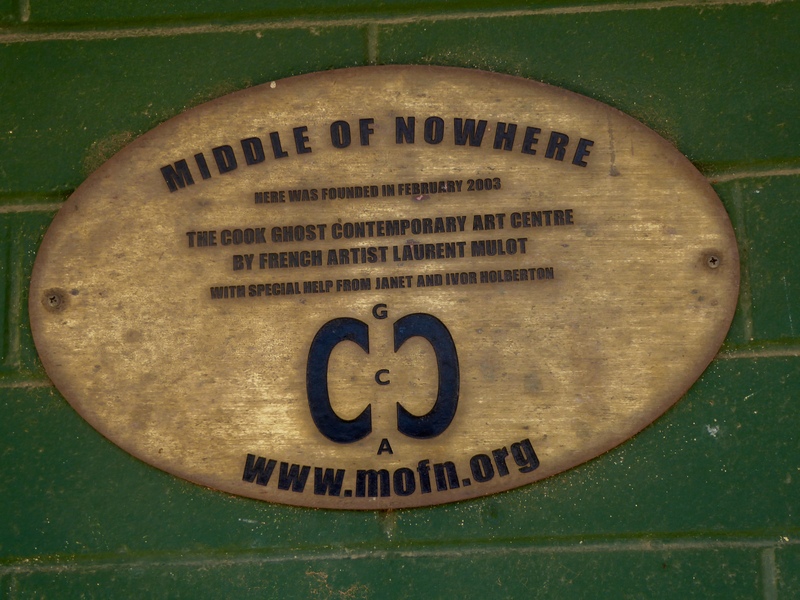 Nullarbor is corrupt Latin for “no trees”. 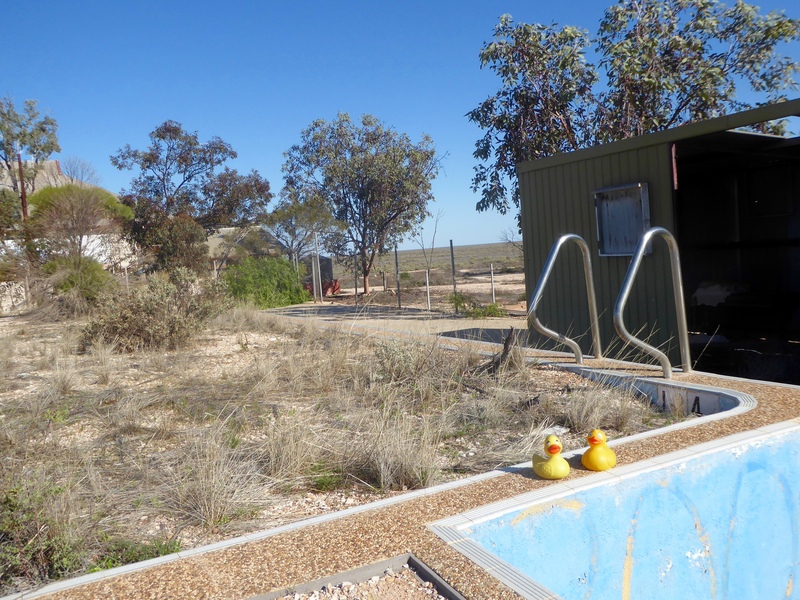 Our National Geographic travel guide describes the Nullarbor this way. For sheer size and scale, no place is like it–an 80,000 square mile limestone plateau, scoured by desert winds and scorched by temperatures that can easily exceed 120 degrees F beneath a pitiless summer sun. The plateau has no surface water at all, although an extensive system of flooded caves lies deep underground. Out here lies the world’s longest stretch of straight railroad track–more than 300 miles. 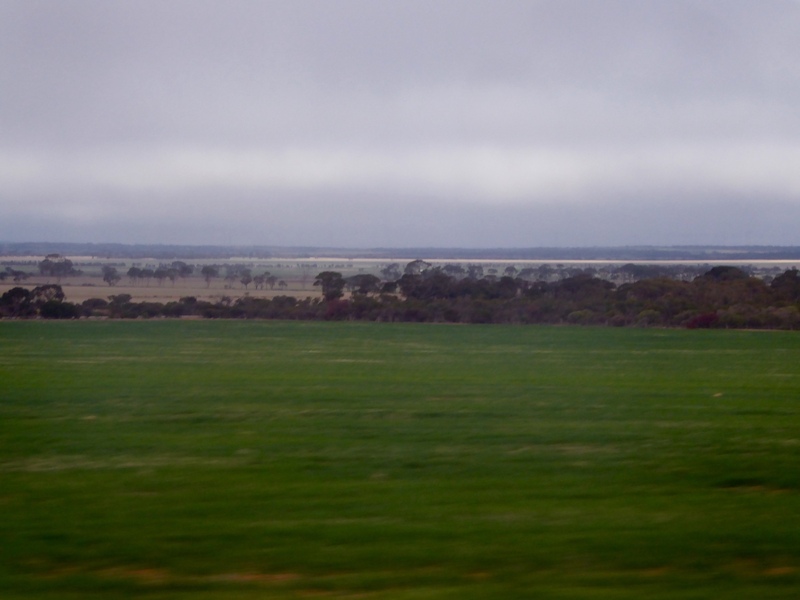 From our train window, we saw a variety of landscapes. Now would be a good time to tell you that although it was cold in Tasmania and cool on Kangaroo Island, we decided to travel to Australia during the Australian winter. We did not want to be in such extreme heat while trying to see many new places. But, we are getting hungry, so we go to our dining car. 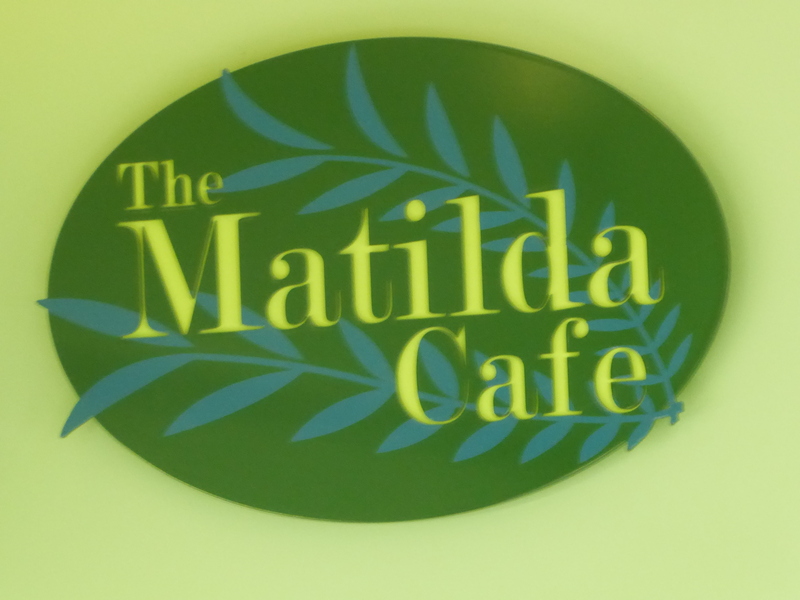 This is the Matilda Cafe. It is our restaurant and our observation car. 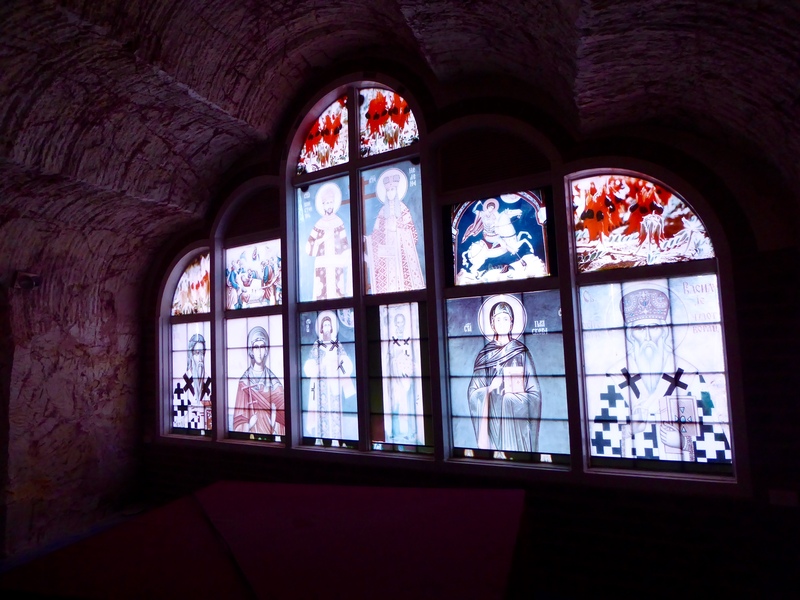 The huge windows are great and it was never crowded. 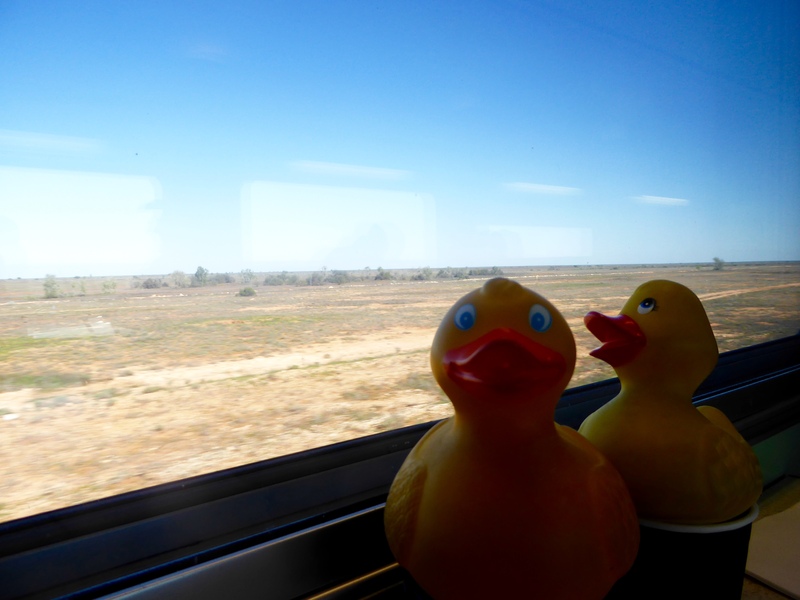 We spent much of our train time here, looking out the windows and snacking. This is our breakfast. Time to eat now. 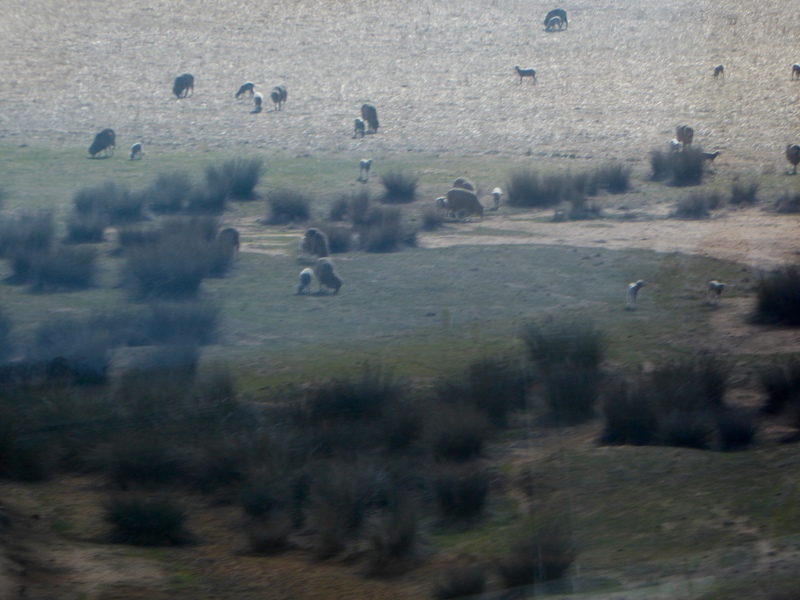 From our windows we saw a few kangaroos and sheep. There are a lot of sheep in Australia. Soon we will be stopping at a very small settlement. We will show you what we see next time. This is our first long train ride and it is fascinating. The scenery is desert, but it changes constantly. 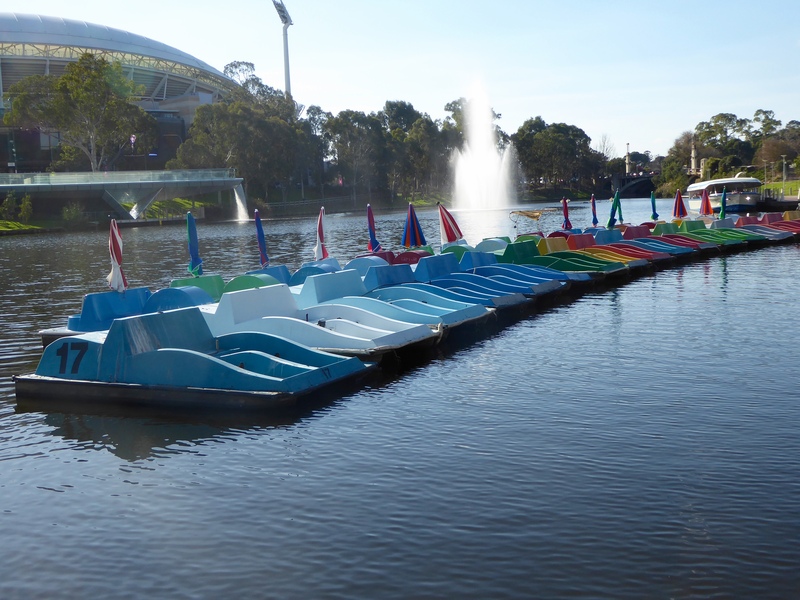 Our time in Adelaide is almost over, so we decided to take the free city bus to Elder Park. 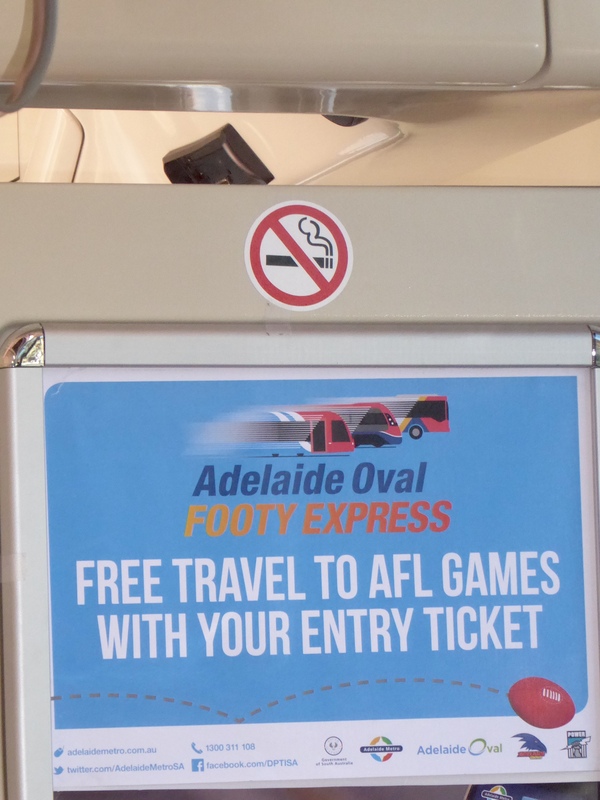 This sign inside the bus shows the support for Adelaide’s athletic teams. Support for the team and the fans. 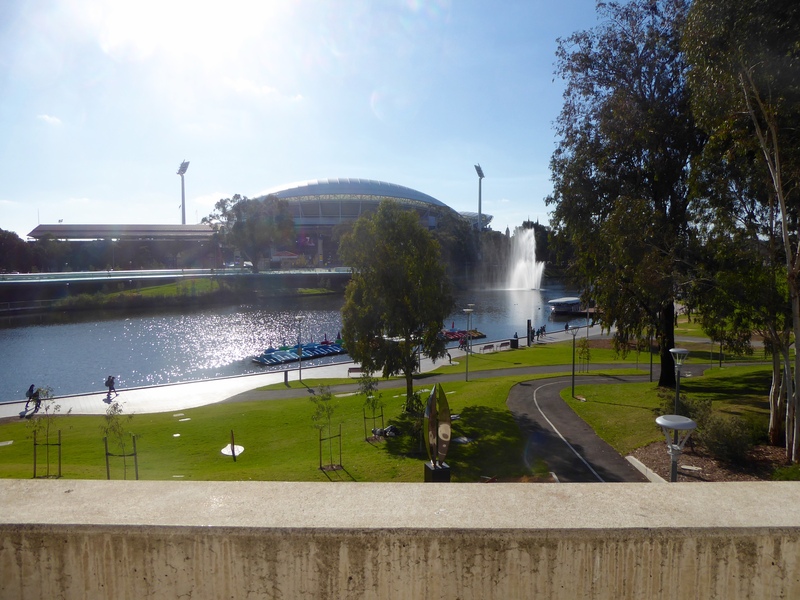 We left the bus near the Adelaide Oval. This artistic design behind the stage caught our eyes. 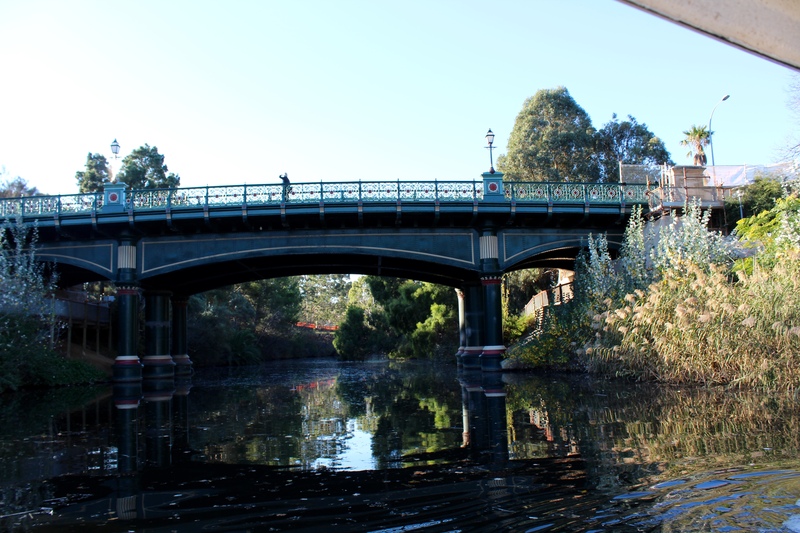 Crossing the bridge, we reached Elder Park, on the River Torrens. 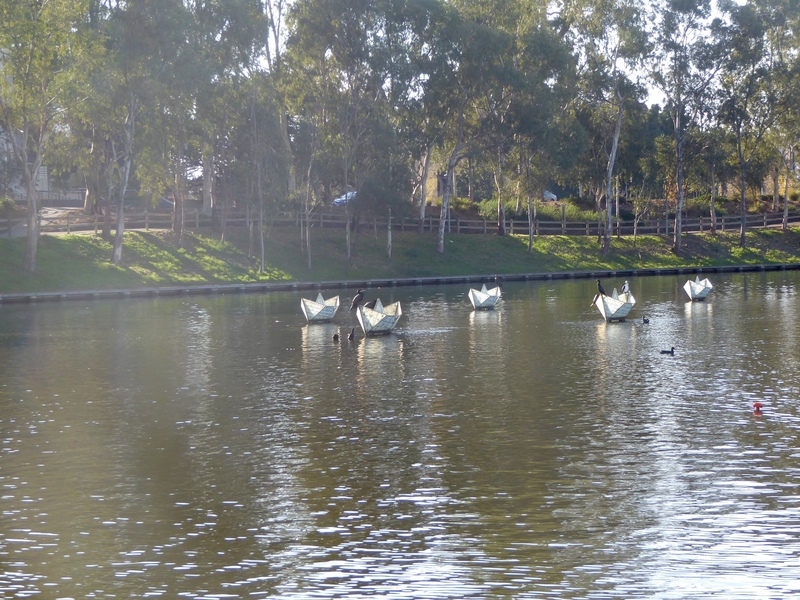 These boats look like fun and good exercise, but not today. 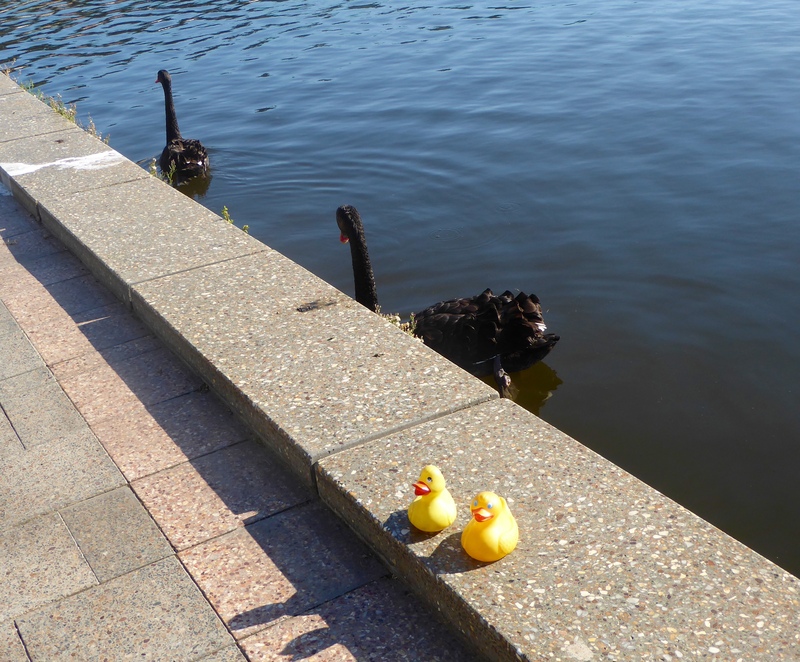 There were many friendly black swans in the river. 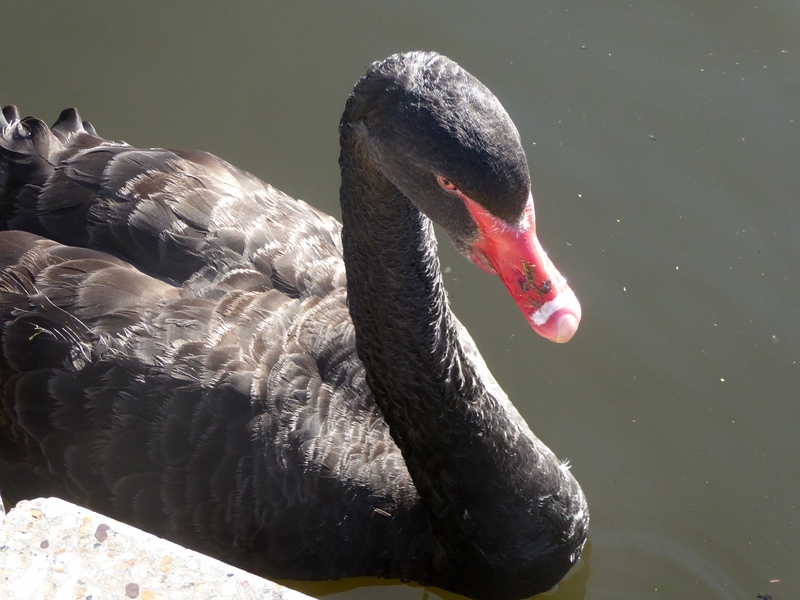 Graceful Black Swans are everywhere. However, this may be a little too close to the swan. We also saw some very curious pelicans. This one wants to know what he purchased at the toy store. 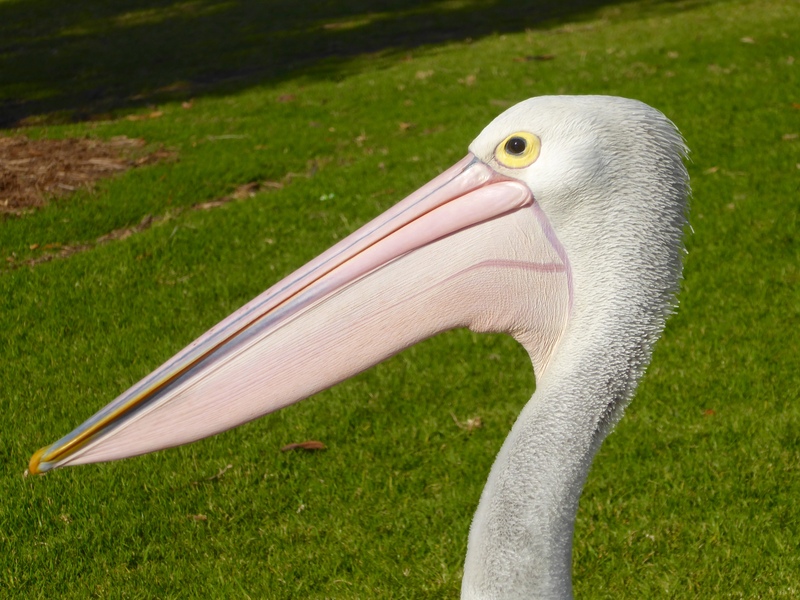 These Australian pelicans are big. 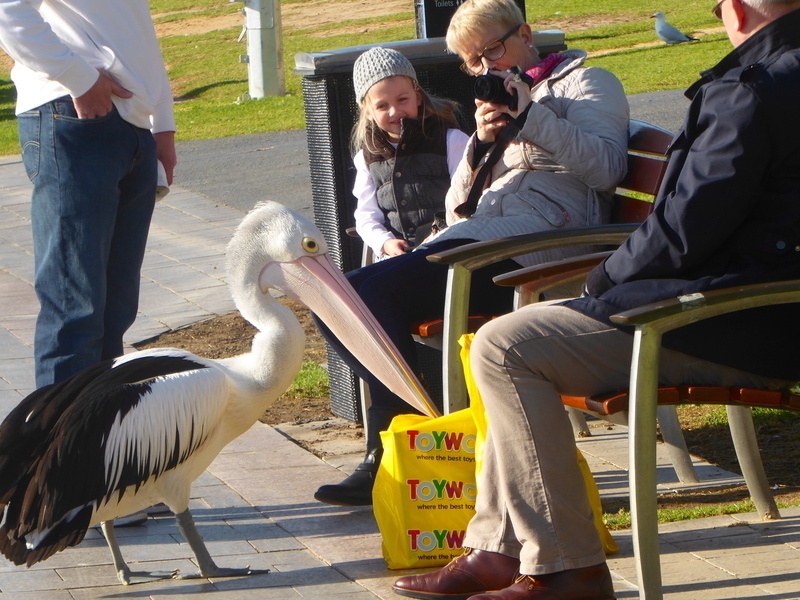 Pelican appears to be taller than these young humans. Again mom, maybe a little too close. 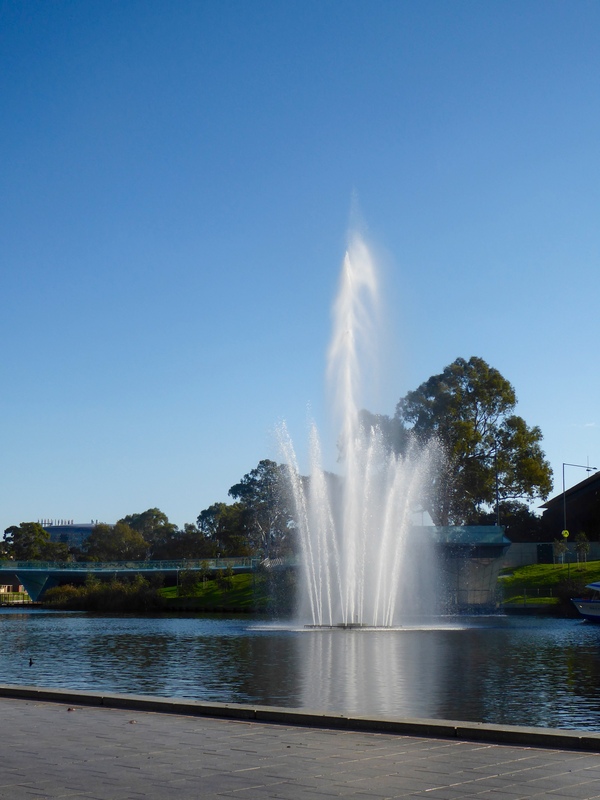 This fountain commemorates the visit by Her Majesty Queen Elizabeth II in March 1954. These are lights on the river. Very nice. This is a tourist boat. We are going on Pop Eye I. We are going on this river boat. We are traveling on the river. We like river boats. 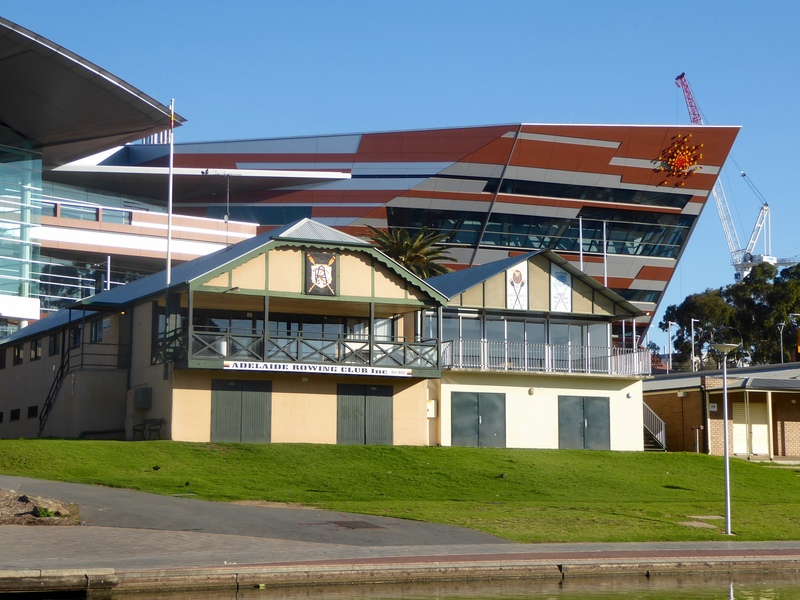 We pass the Adelaide Rowing Club. Passing under the historic bridge, this friendly pedestrian waves to us. 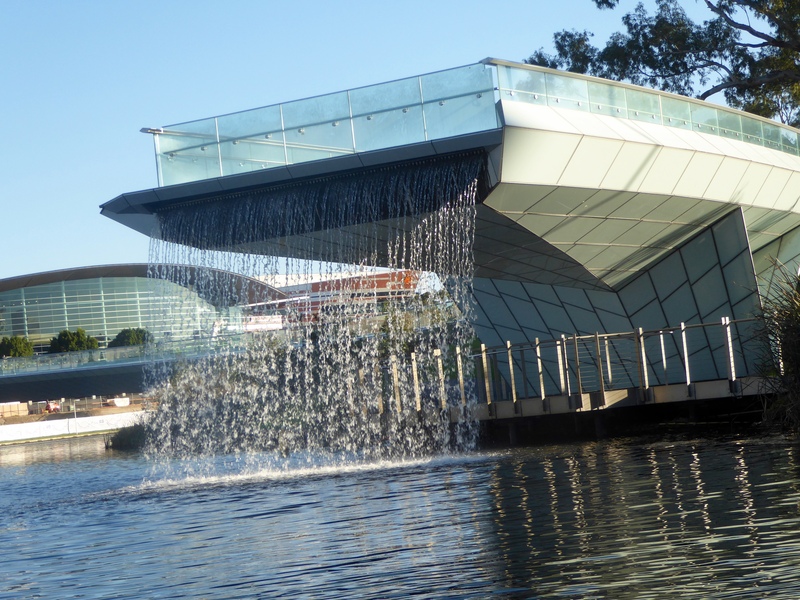 We like this falling water. 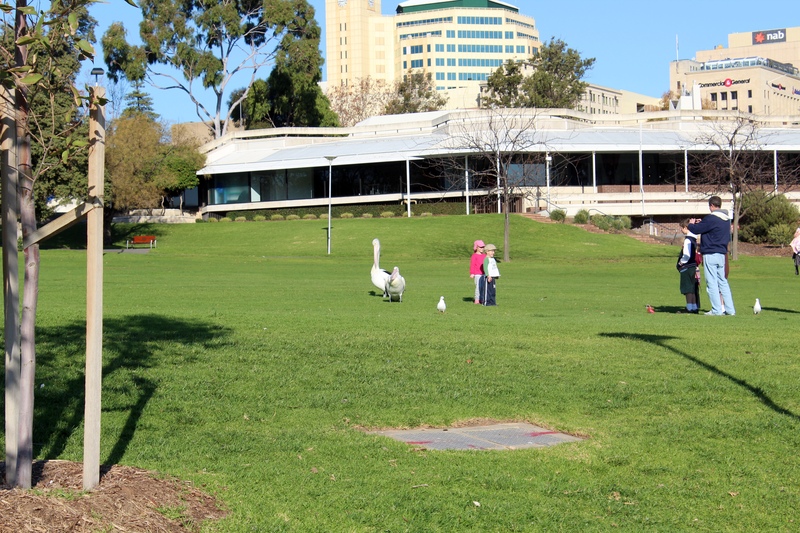 If you have some time in Adelaide, we suggest a few hours or a day at this park. Relax and enjoy your vacation, or your home town. 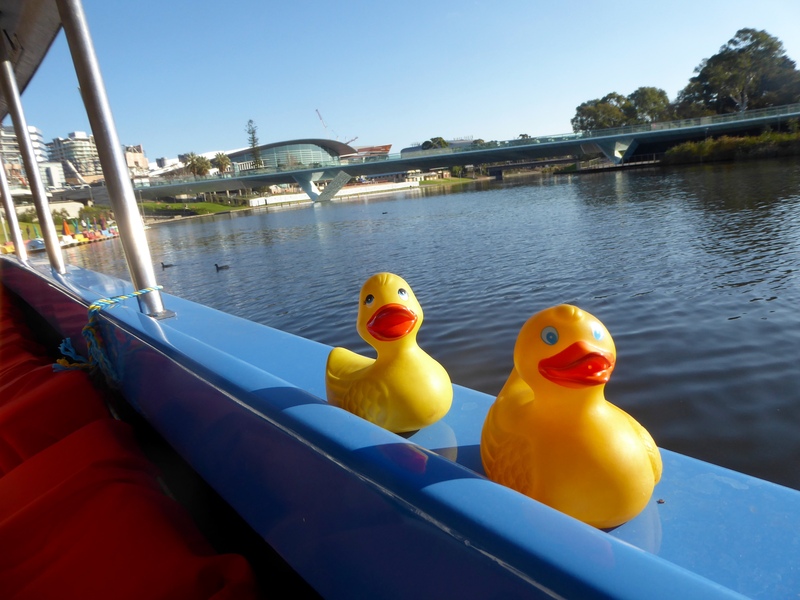 Zeb, Eider and the humans took Adelaide’s free city bus to view monuments and more. 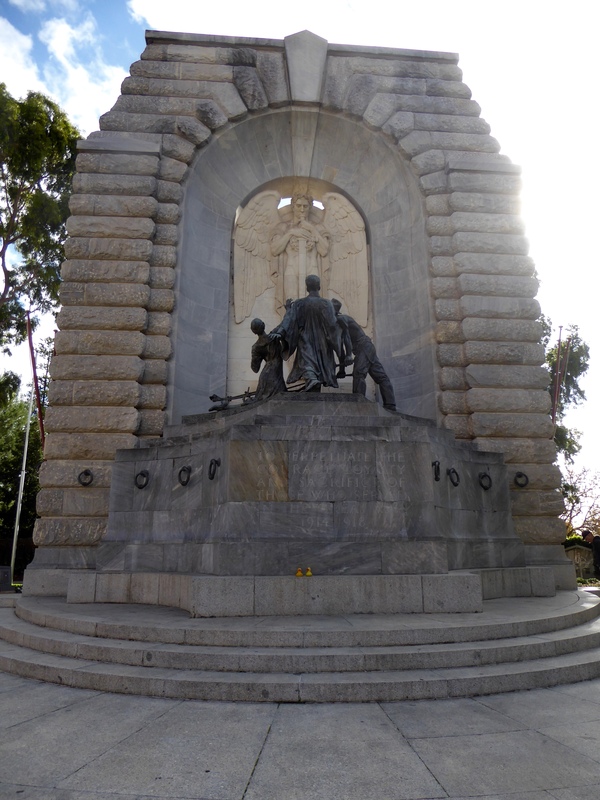 This statue is in memory of those who fell serving and defending Australia. The Honorable Dame Roma Mitchell is honored here. She is a former Governor of South Australia, a former Chancellor at the University of Adelaide and a former Judge on the Supreme Court of South Australia. Wow! She was a great lady! 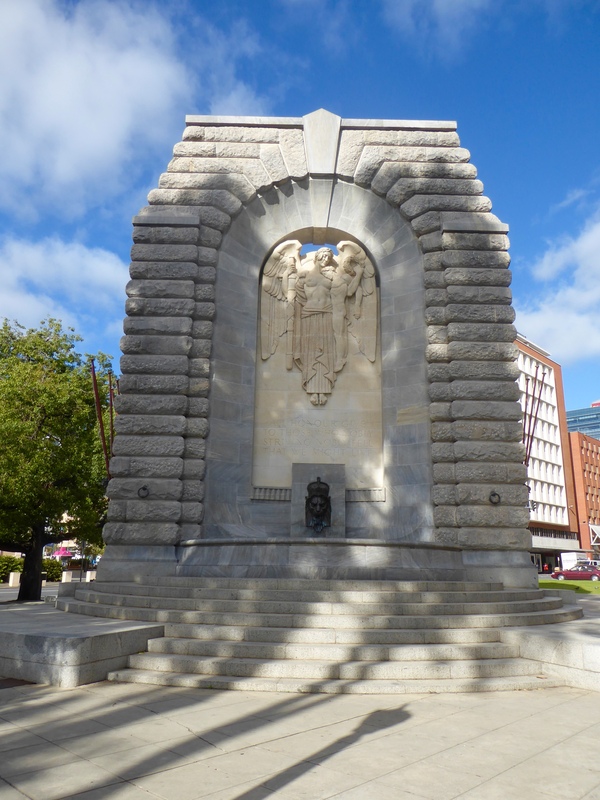 Here is the front of the Memorial remembering those lost in World War I and World War II. This is the back of the Memorial. Humans also walk inside the memorial to view additional exhibits. 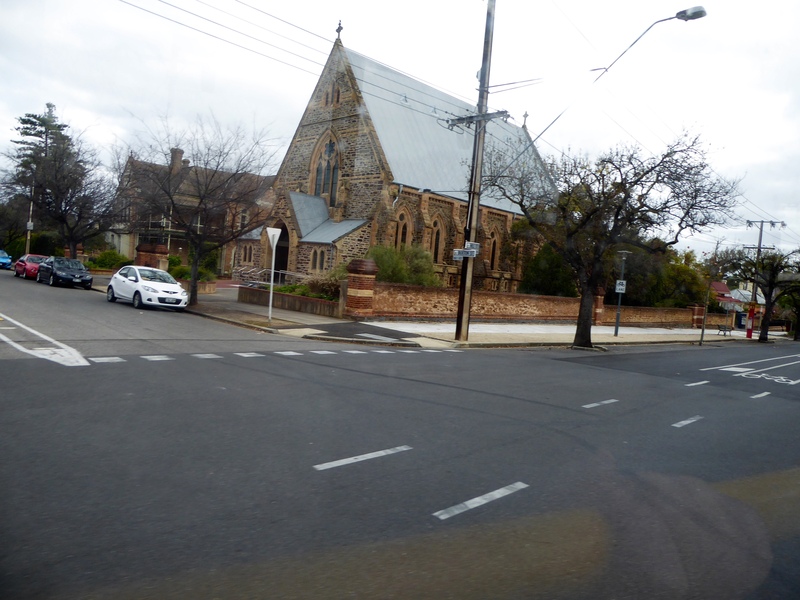 The streets of Adelaide are very clean. These trash containers are part of the reason. 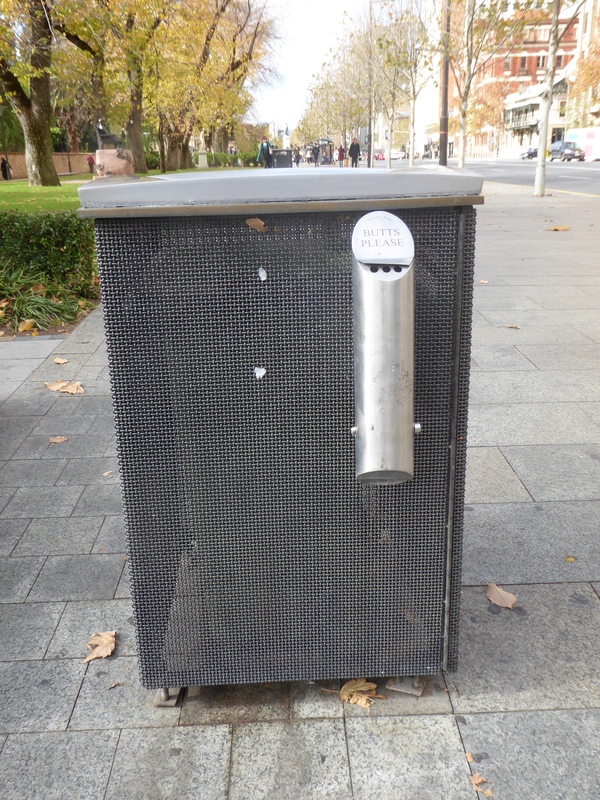 Put trash in one place and cigarette butts in another place and keep Adelaide clean. 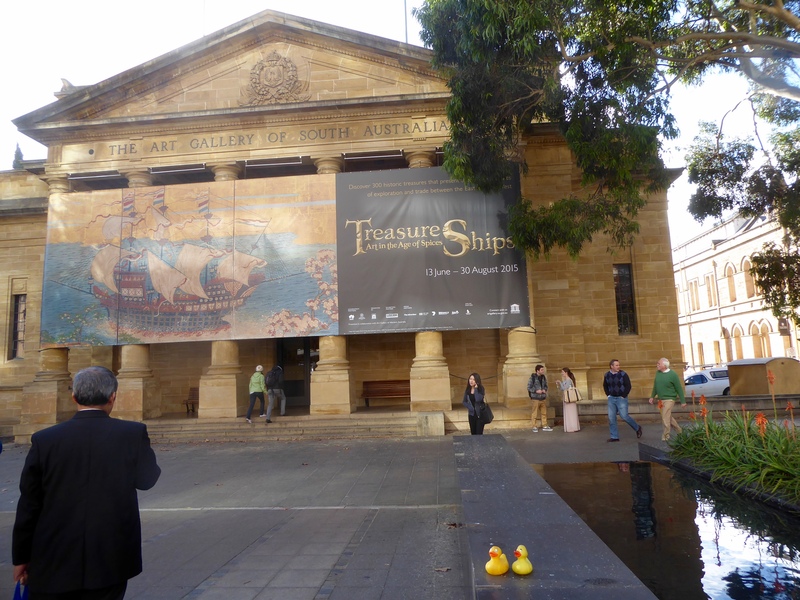 The Art Gallery of South Australia hosts a special exhibit. 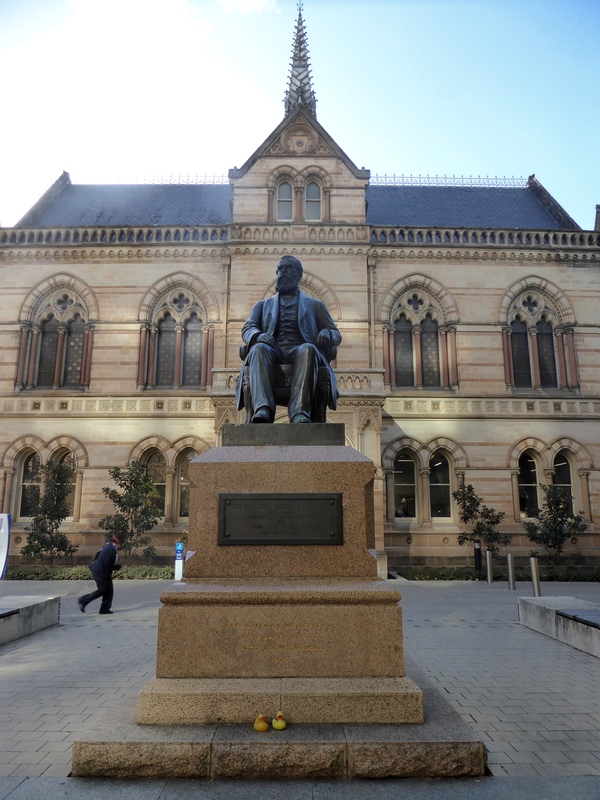 Sir Walter Watson Hughes, one of the founders of and the first donor to the University of Adelaide, is honored here. 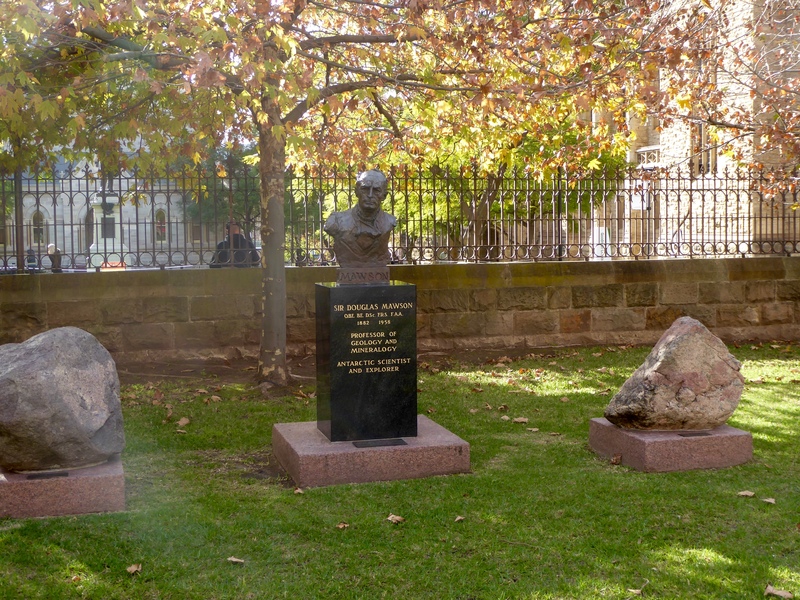 Sir Douglas Mawson, Professor of Geology and Mineralogy was also an Antarctic scientist and explorer. 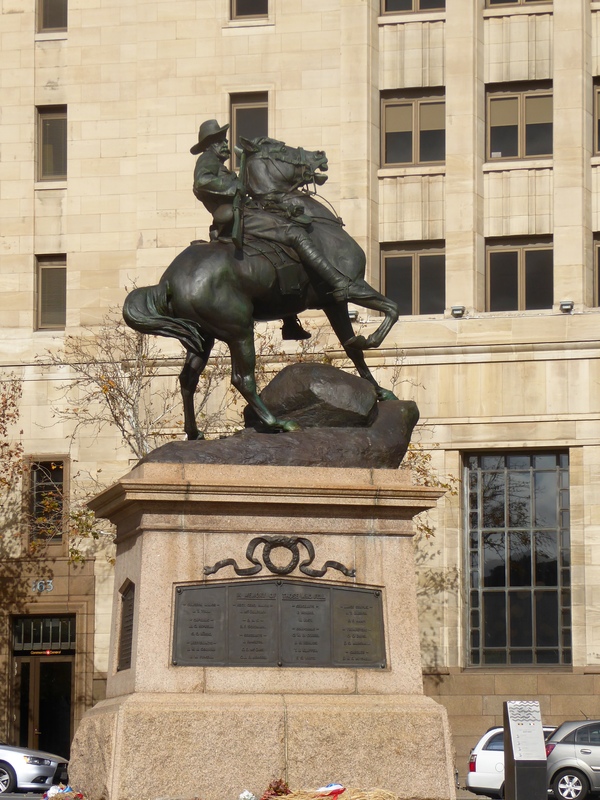 Australia honors many of its outstanding citizens. 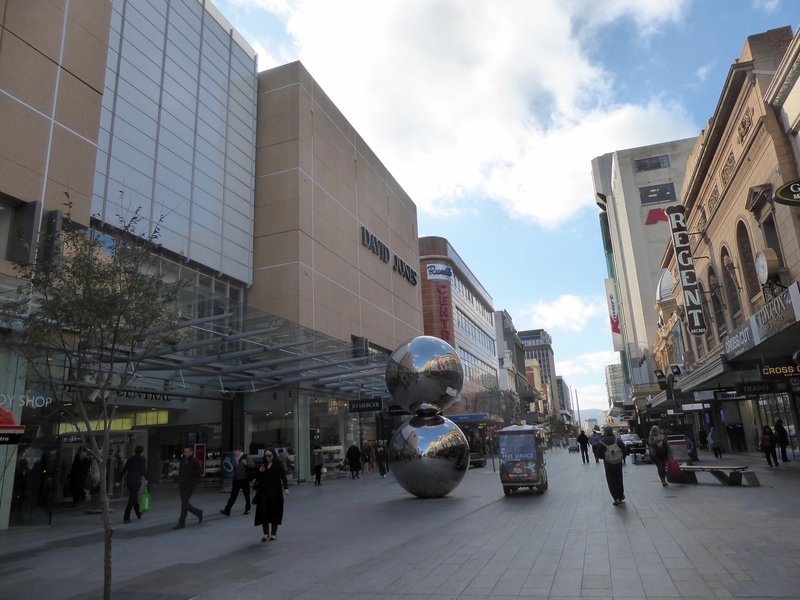 Adelaide is also home to the premier retail area of South Australia. 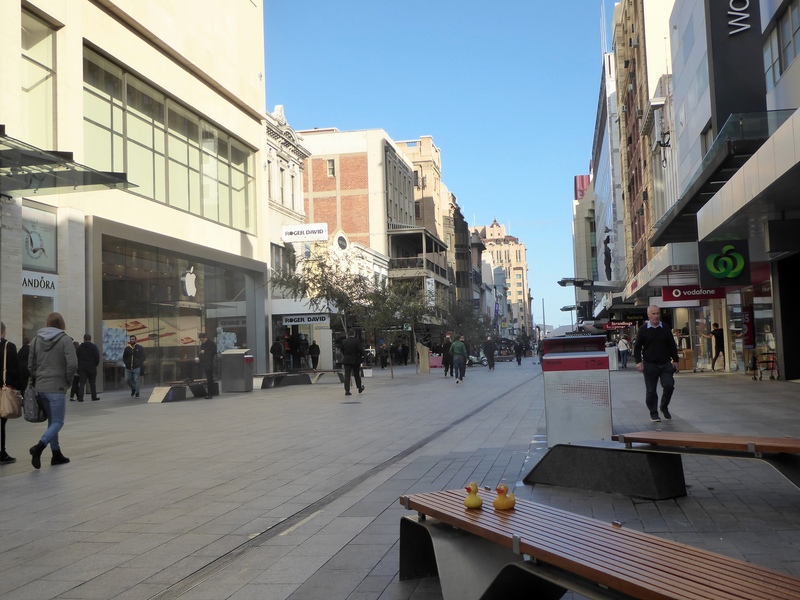 Rundle Mall became Australia’s first pedestrian mall in 1976. 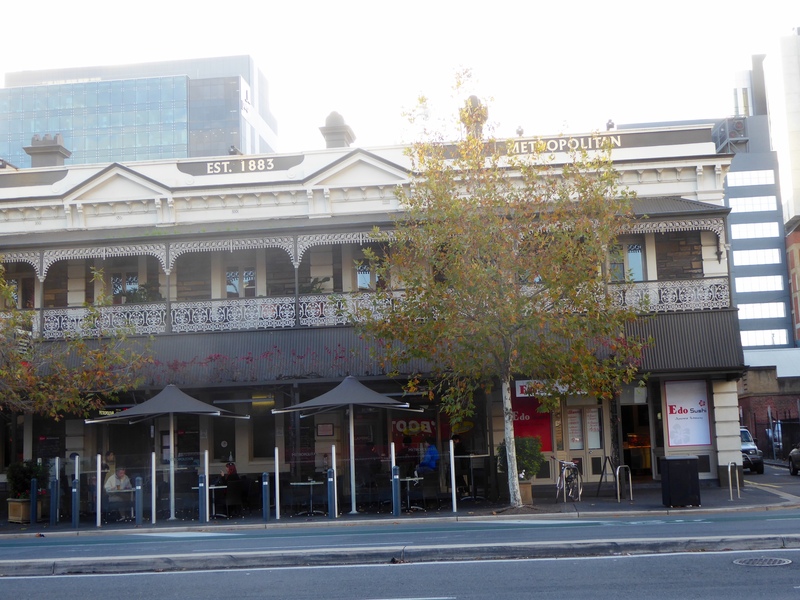 We wandered around Rundle Mall just before sunset. The street is lined with world famous retail stores. We like the sculptures also. 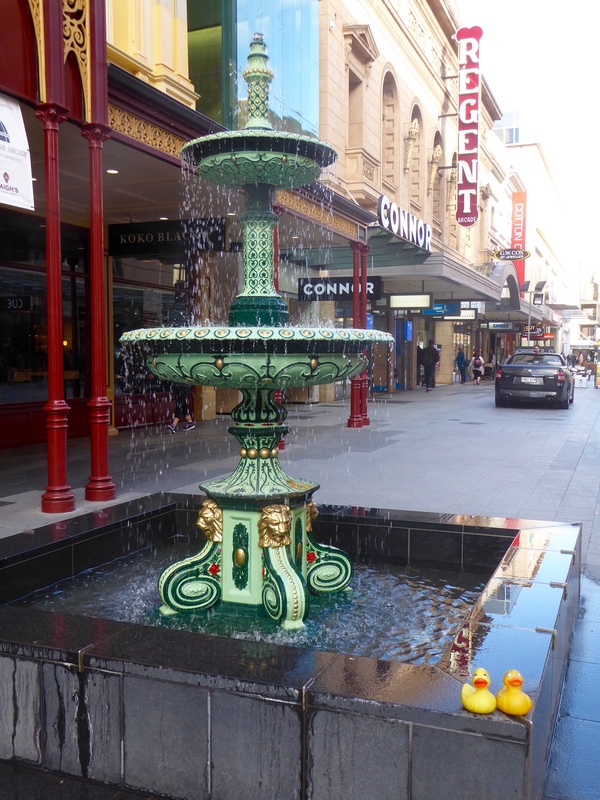 This fountain appeals to us. We find water soothing. 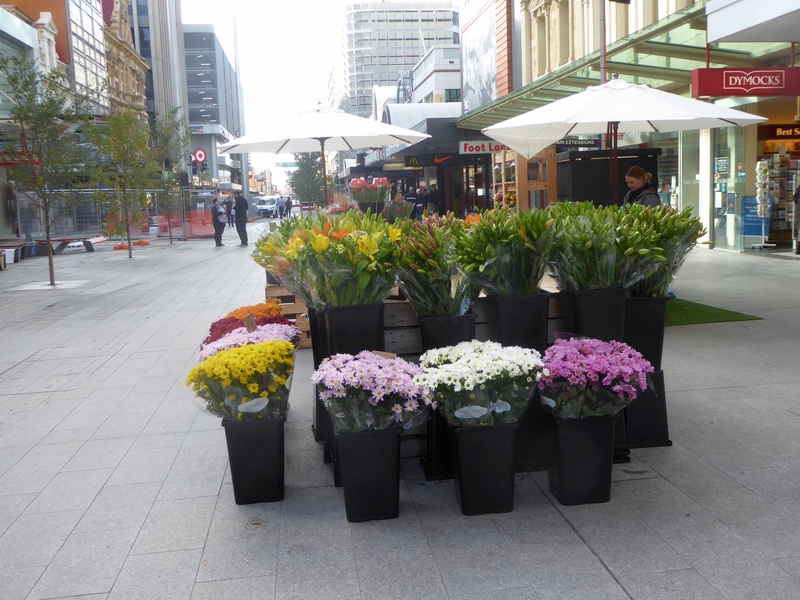 Malls with flower shops always seem more friendly. 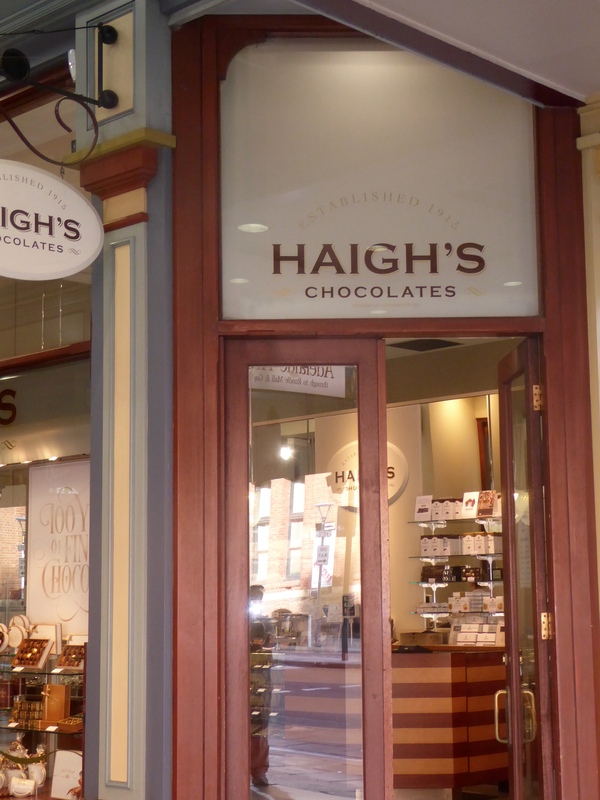 Of course, mom found the local chocolate store. We are glad she did; the chocolate was delicious. We like Adelaide. Tomorrow we will show you a little more before we leave town. 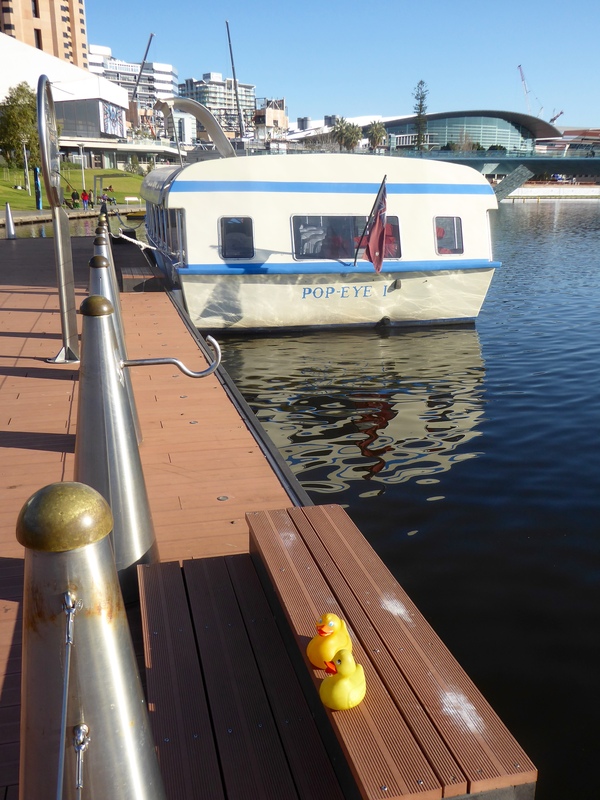 Zeb and Eider Duck only have a couple days to explore Adelaide, in the state of South Australia. What to do? 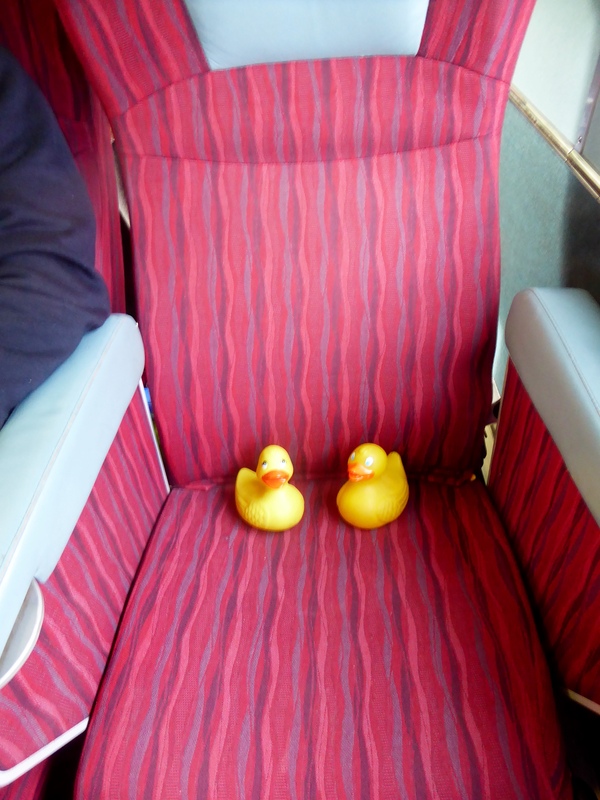 The humans decided to ride the free city bus that will give them an overview of the city. We like the old buildings that are still used today. This old church looks really inviting. While on the bus, mom started talking to a lady from Adelaide. The lady moved to Australia from the Philippines several years ago. She loves Australia. She told the humans that they had to see Central Market. 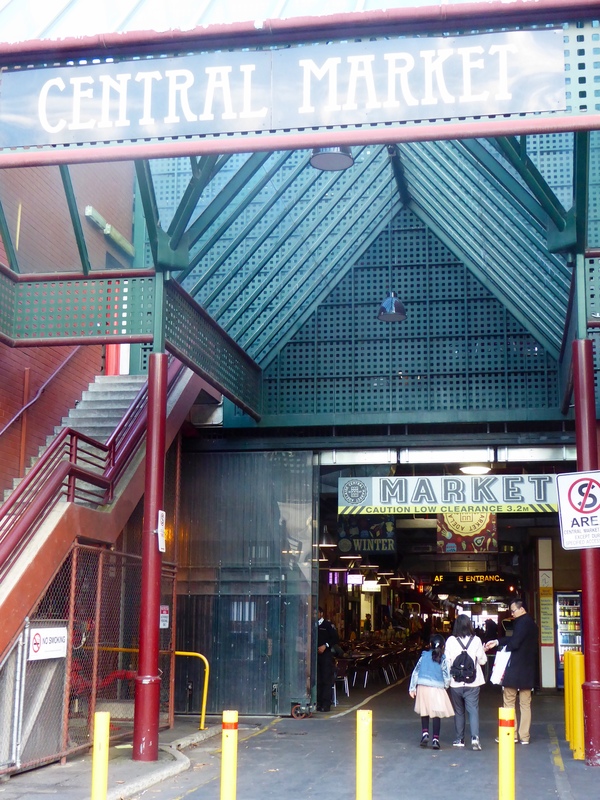 The humans try to go where local people suggest, so we went to Central Market. 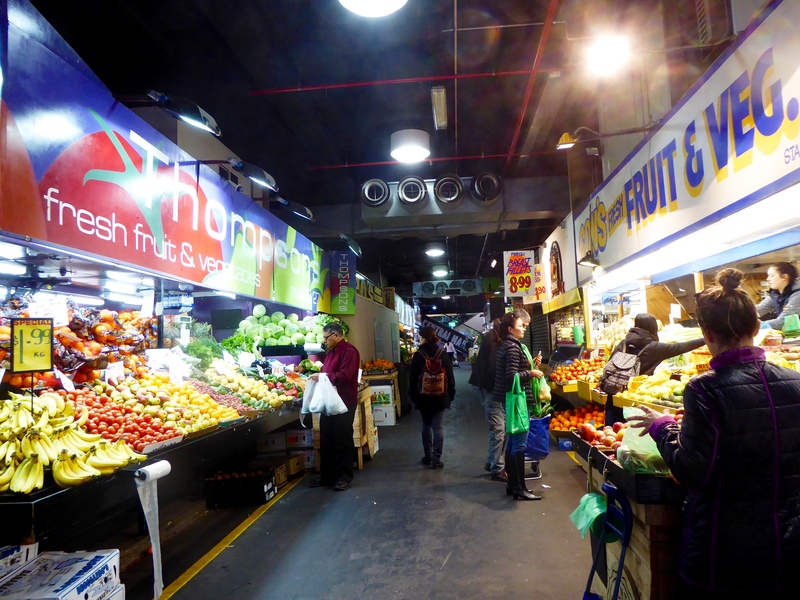 This is a huge market with small restaurants, many everyday items for sale, and of course, lots of groceries. As we entered Central Market, we noticed that meat and vegetables are sold by the kilo. We are accustomed to buying items by the pound. 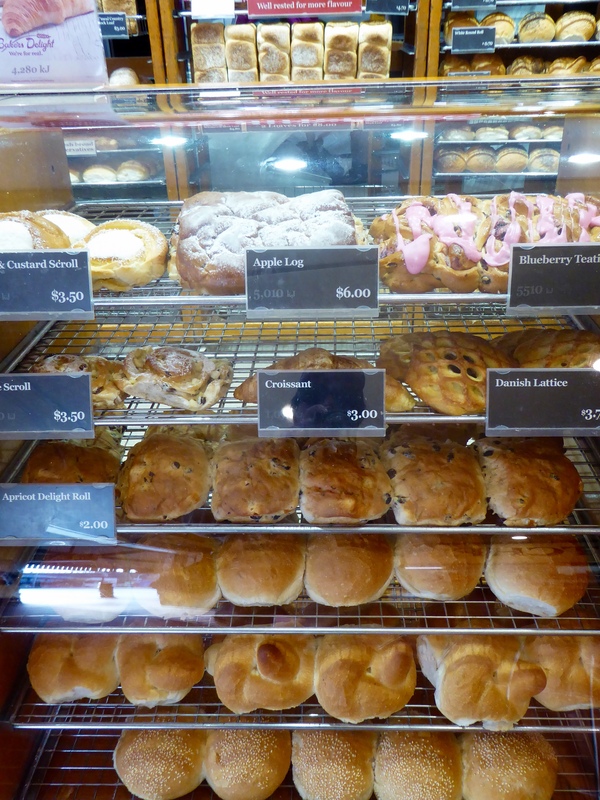 But, one kilo is 2.2 pounds, so we are adjusting to the metric system. 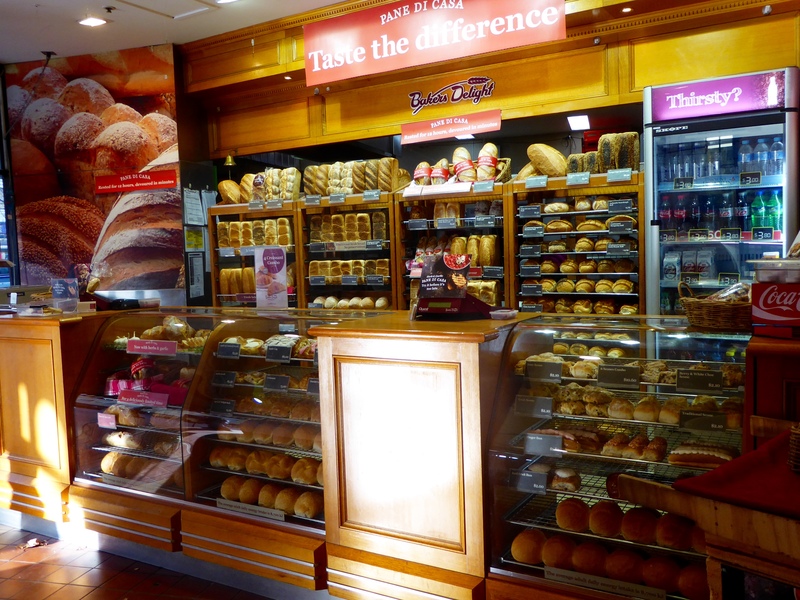 The bakery is near the entrance. It smells so good, we need a closer look. Yum! This aisle featuring fresh produce is so colorful. This cheese shop certainly made us smile. 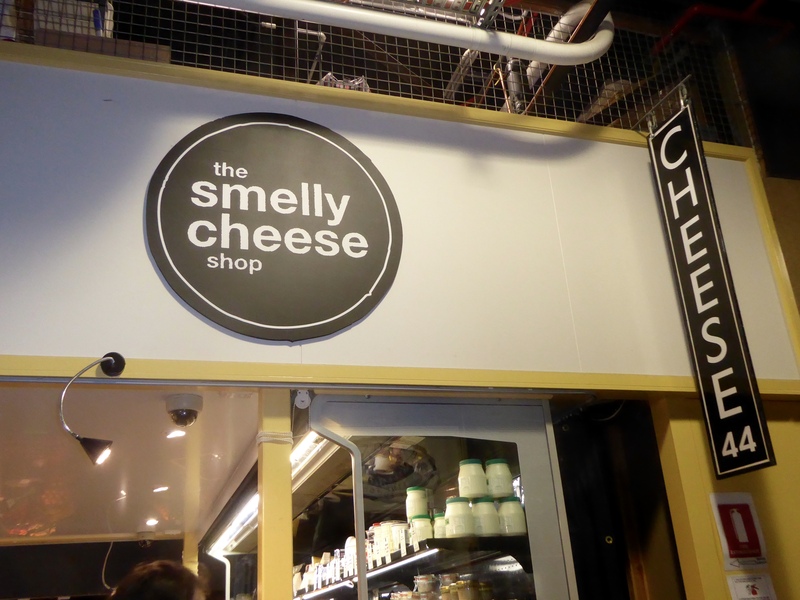 Smelly Cheese Shop. 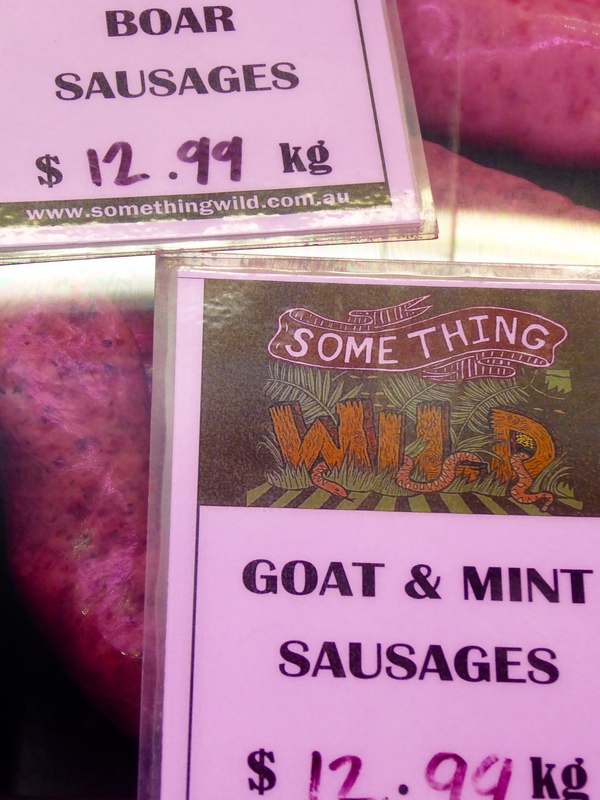 The biggest surprise for us was the Some Thing Wild store. 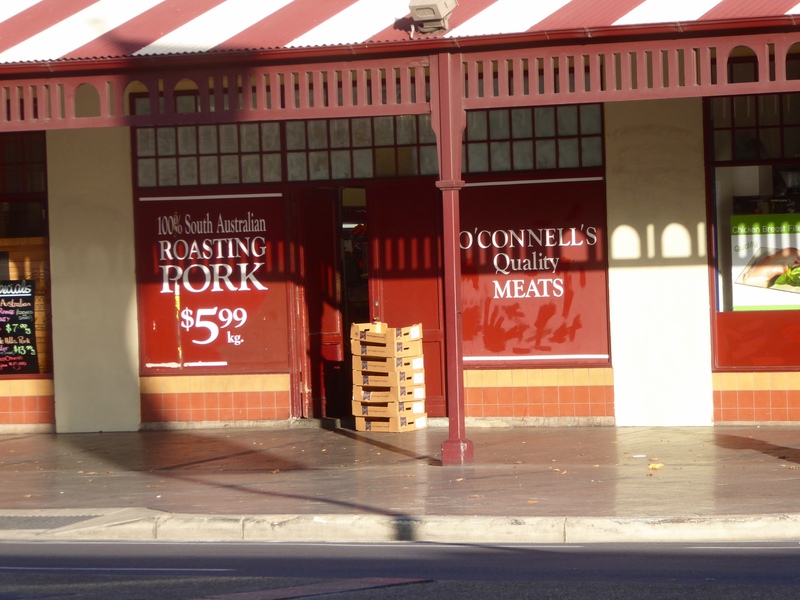 This is no normal butcher shop. Wild and exotic game is available here. 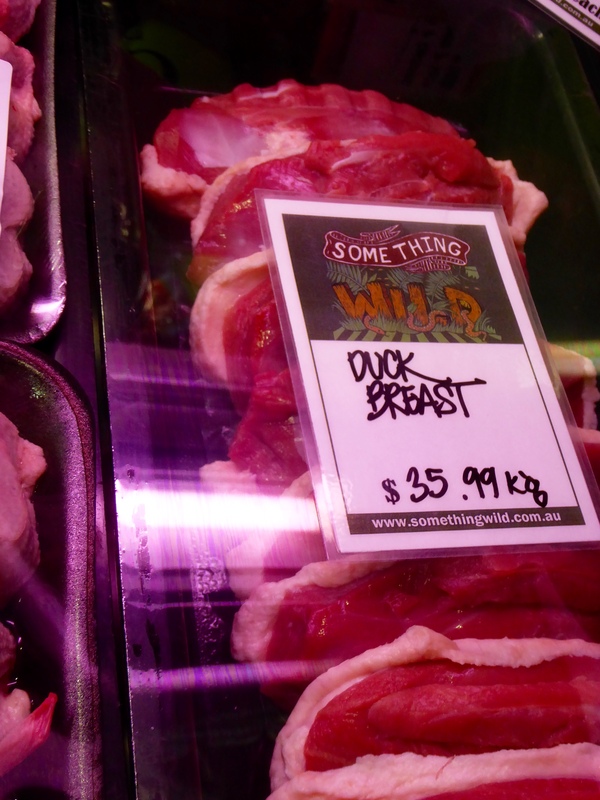 Duck breast??? We Colorado Traveling Ducks are not sure we like that. The assorted sausages are better for us to see. 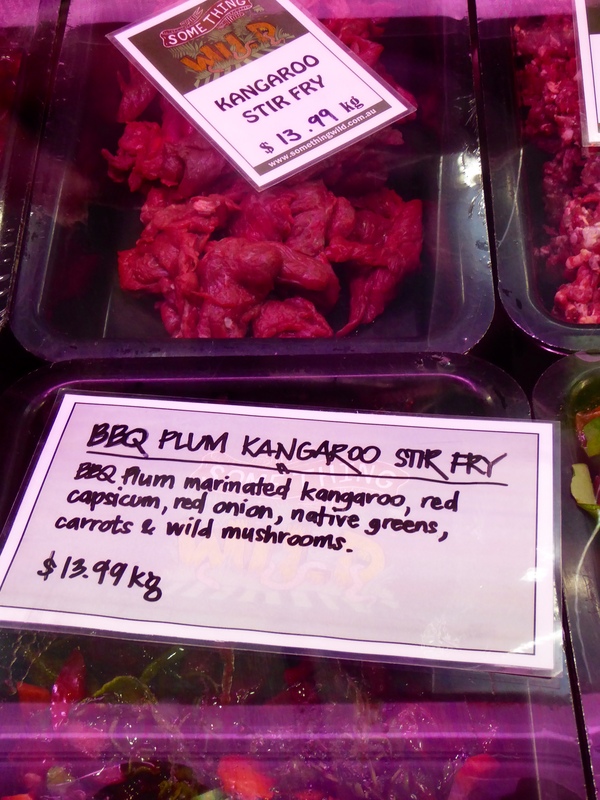 This kangaroo stir fry is ready to take home and cook. Could be a very nice dinner. Check out the special of the day. 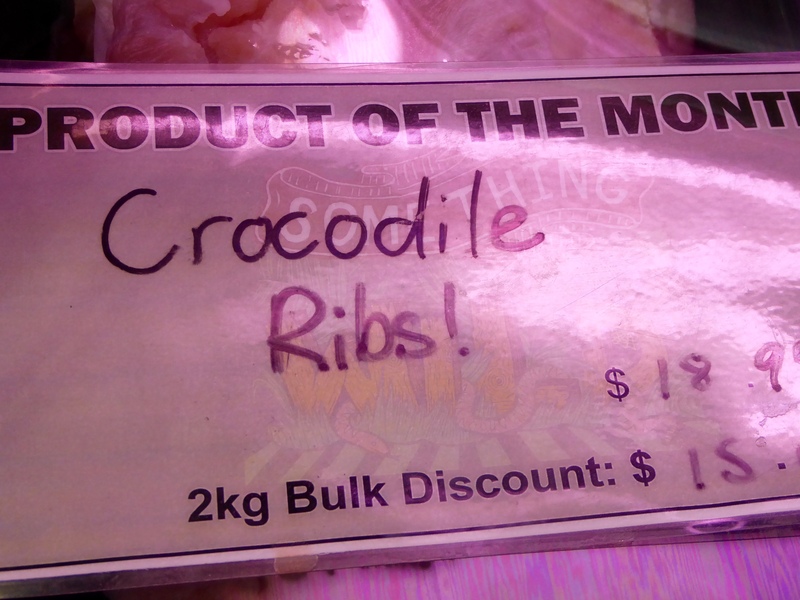 Crocodile ribs. I have never seen them for sale before. This market had all the normal market items, but we saw some new things too. Visit Central Market and try some of the food. You will enjoy new tastes. 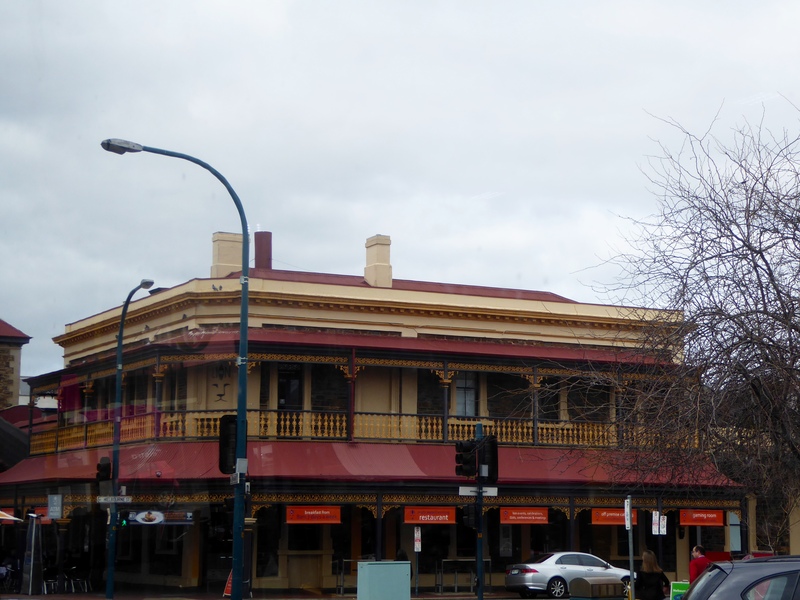 Again, we like the old buildings being used today. This one is across from Central Market. 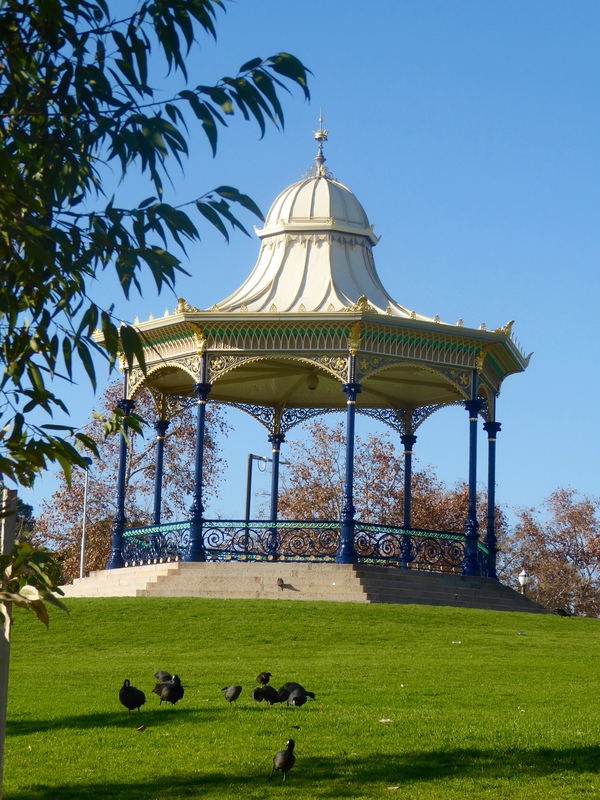 When you visit Adelaide, ride the free city bus, routes 98 and 99. And talk to people. The people will suggest things for you to see and do. It is fun, also. 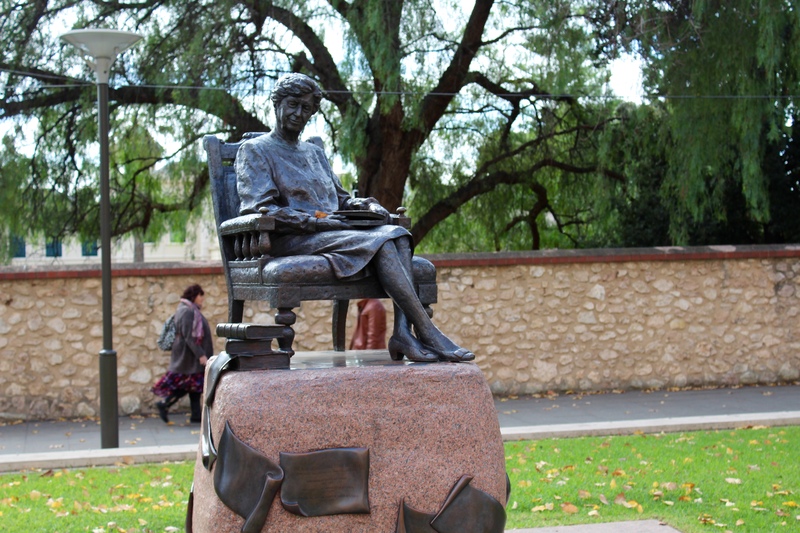 We will show you more of Adelaide soon.